Another species with a particularly beautiful song, their song has been described as a subdued mellow warbling, resembling a more refined version of the American Robin’s. 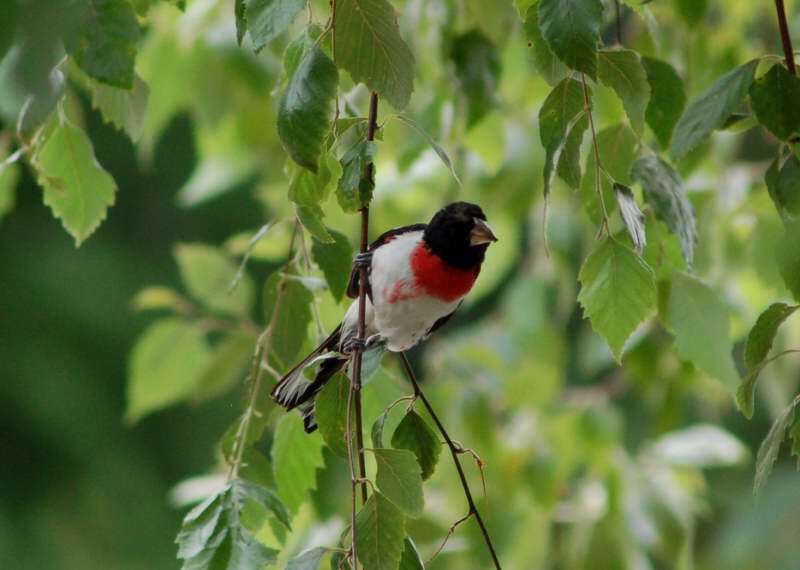 Or, as All about birds puts it, the grosbeak’s song is like that of the robin, only as sung by an opera singer. 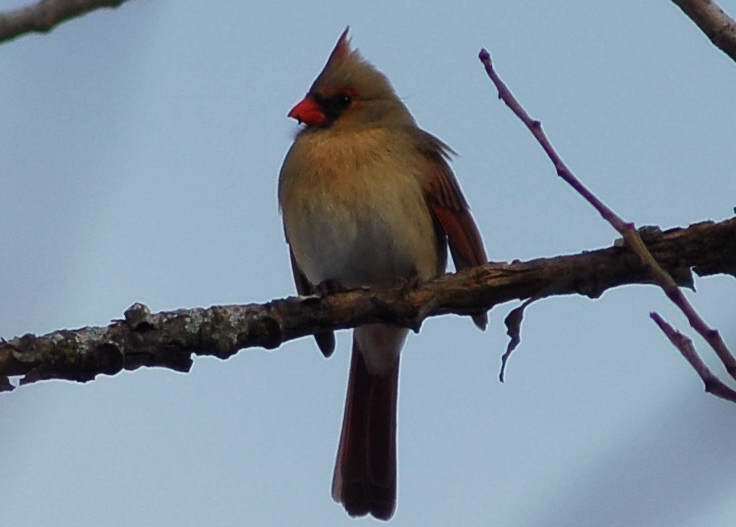 Fortunately, males start singing early, occasionally even when still in winter quarters. 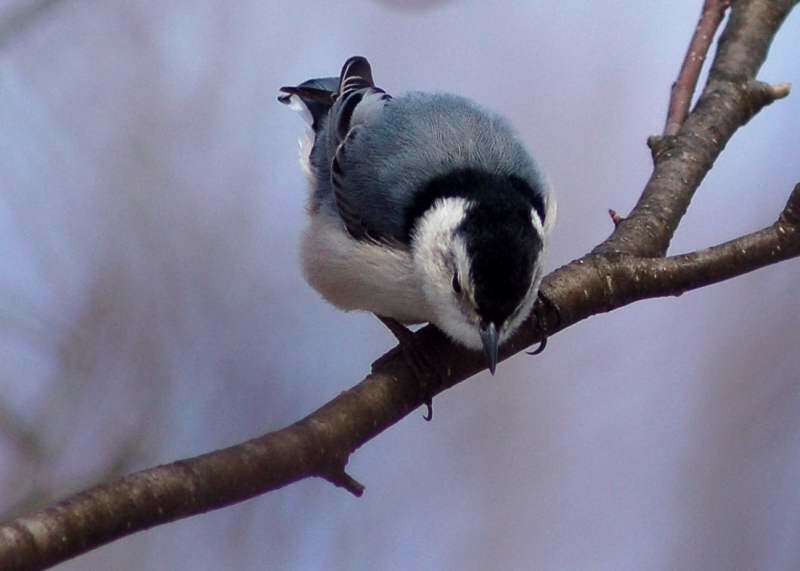 Their diet is varied, you would think that by the shape of their beak that they would be primarily seed eaters, but in fact, insects make up the majority of their diet. 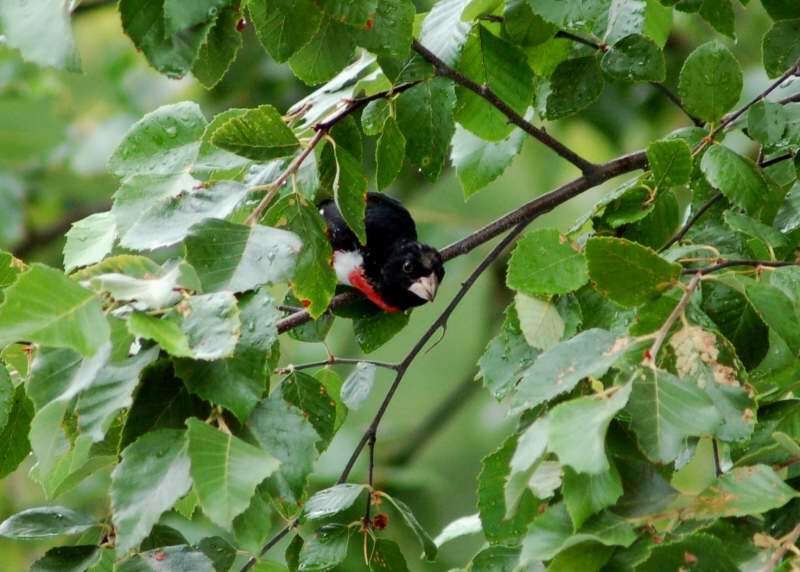 They do feed on seeds and berries as well as insects. 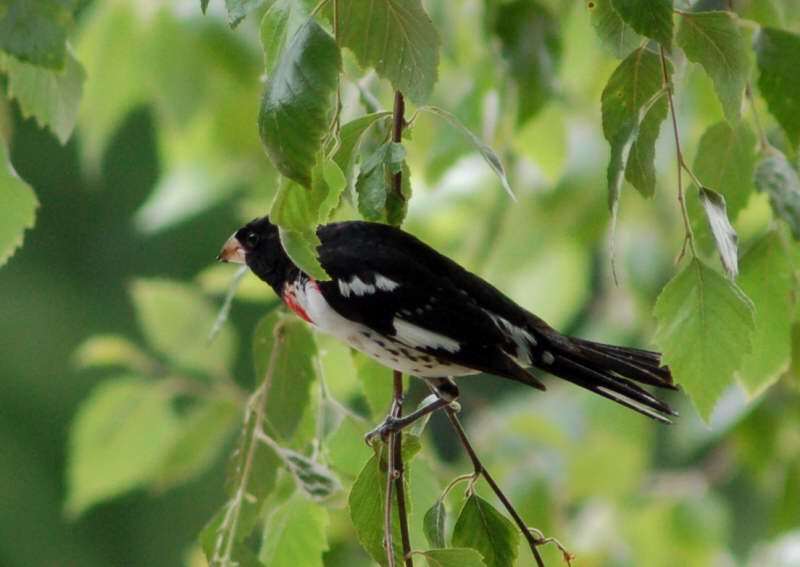 The Rose-breasted Grosbeak forages in shrubs or trees for insects, seeds and berries, also catching insects in flight and occasionally eating nectar. 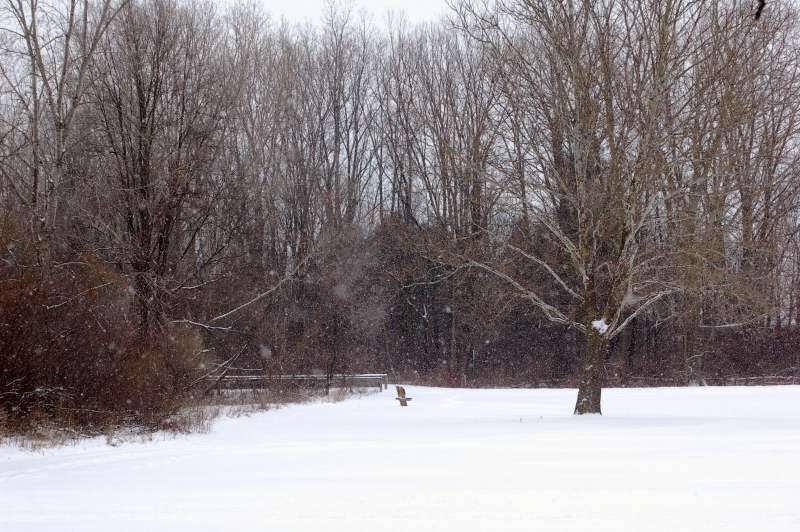 It usually keeps to the treetops, and only rarely can be seen on the ground. 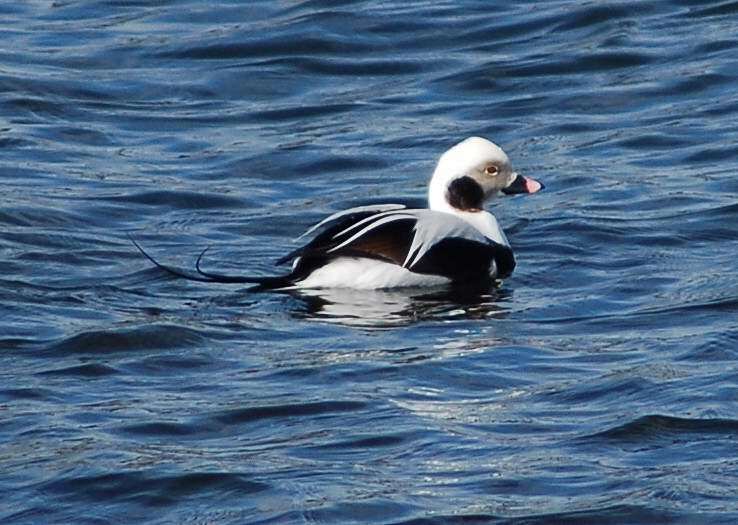 During breeding it is fairly territorial, in winter, it roams the lands in groups of about a handful of birds, and sometimes in larger flocks of a dozen or more. This is number 43 in my photo life list, only 307 to go! 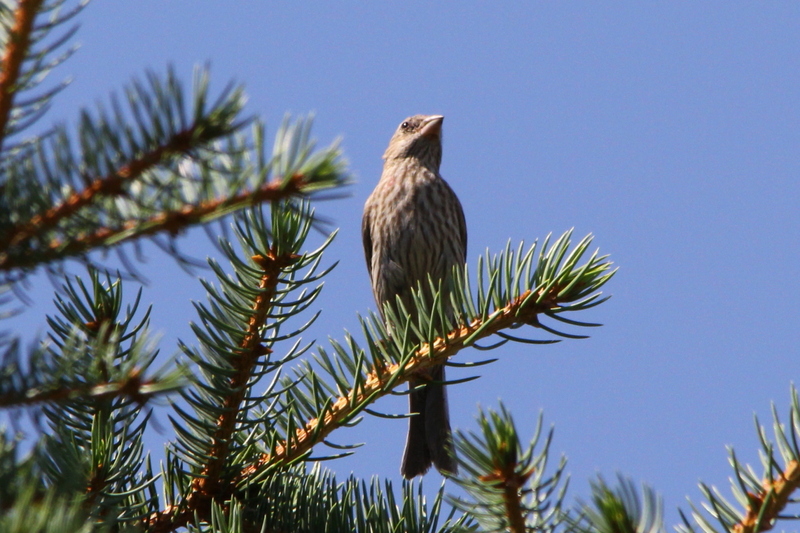 To start with, I love listening to these birds sing! 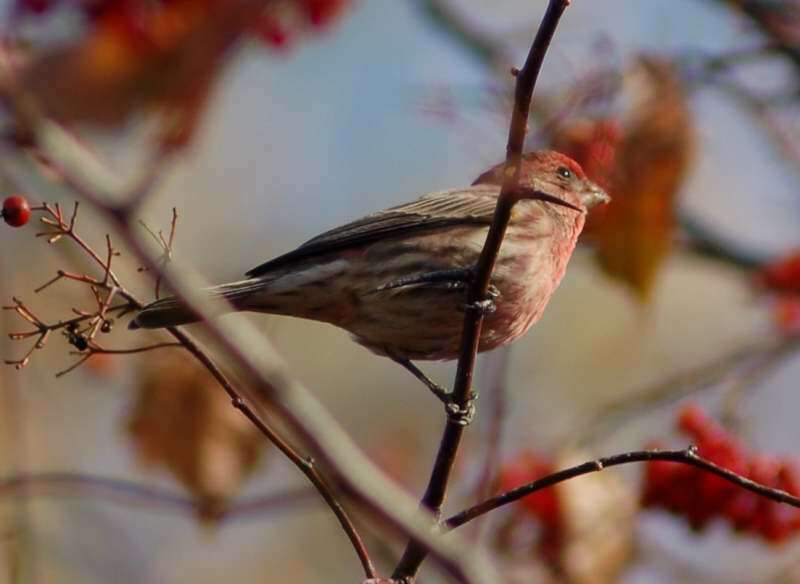 Their song is a rapid, cheery warble, and it is a sure sign of spring arriving. Originally only a resident of Mexico and the southwestern United States, they were introduced to eastern North America in the 1940s. 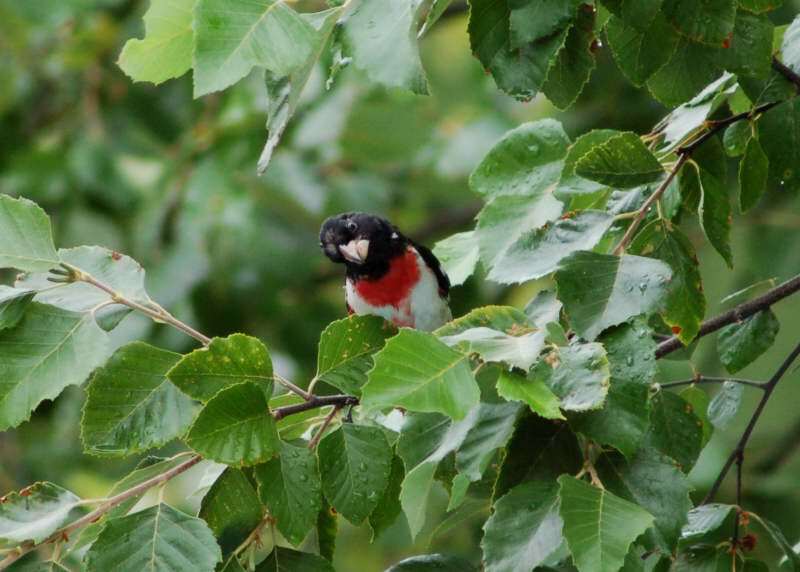 The birds were sold illegally in New York City as “Hollywood Finches”, a marketing artifice. 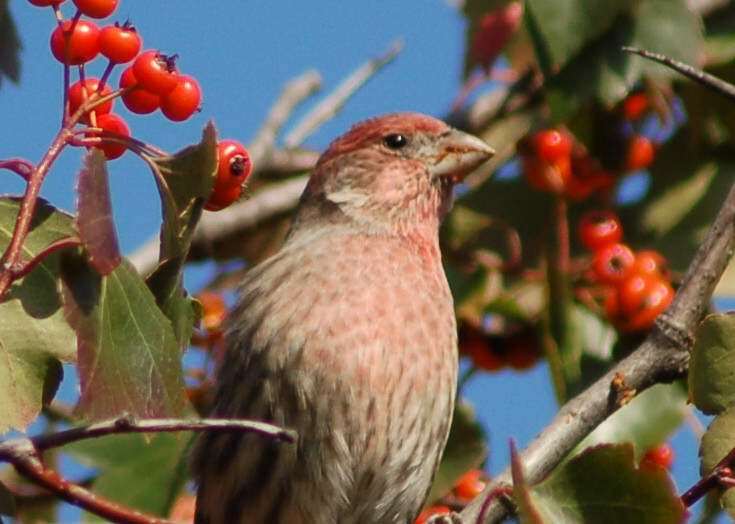 To avoid prosecution under the Migratory Bird Treaty Act of 1918, vendors and owners released the birds. 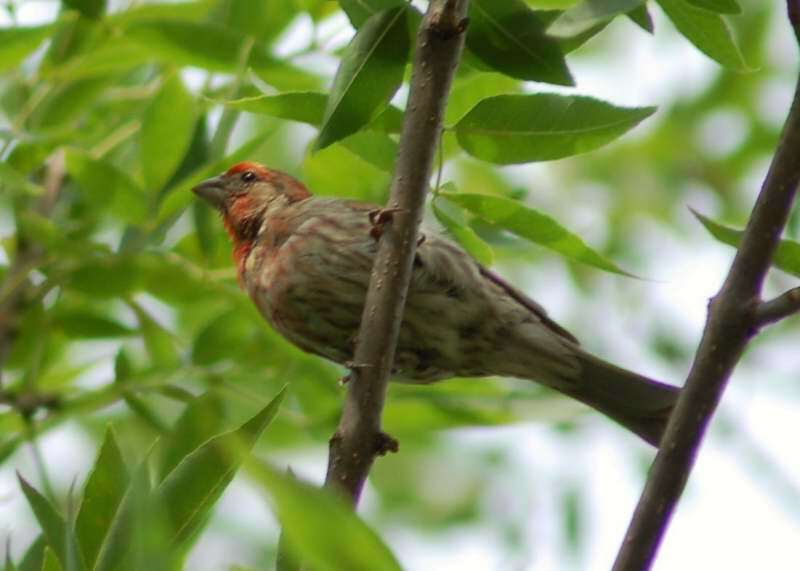 They have become naturalized; in largely deforested land across the Eastern U.S., they have displaced the native Purple Finch and even the non-native House Sparrow. 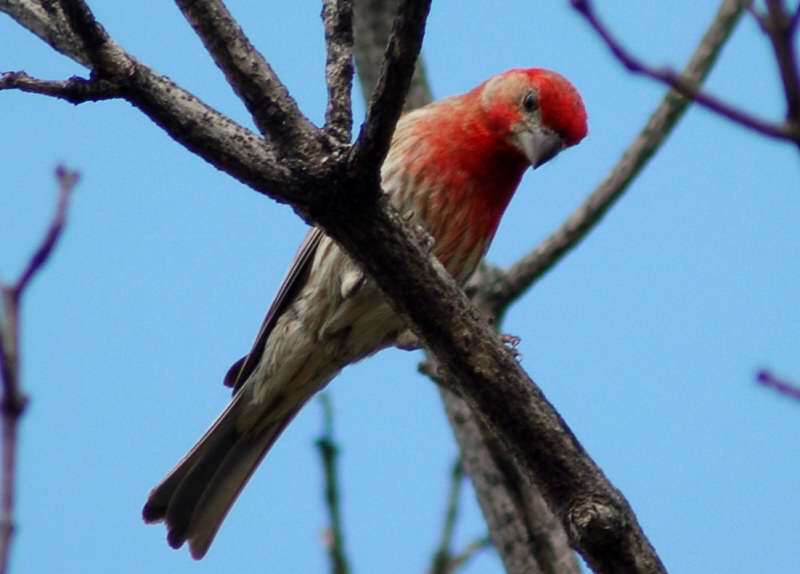 Male coloration varies in intensity with the seasons and is derived from the berries and fruits in its diet. 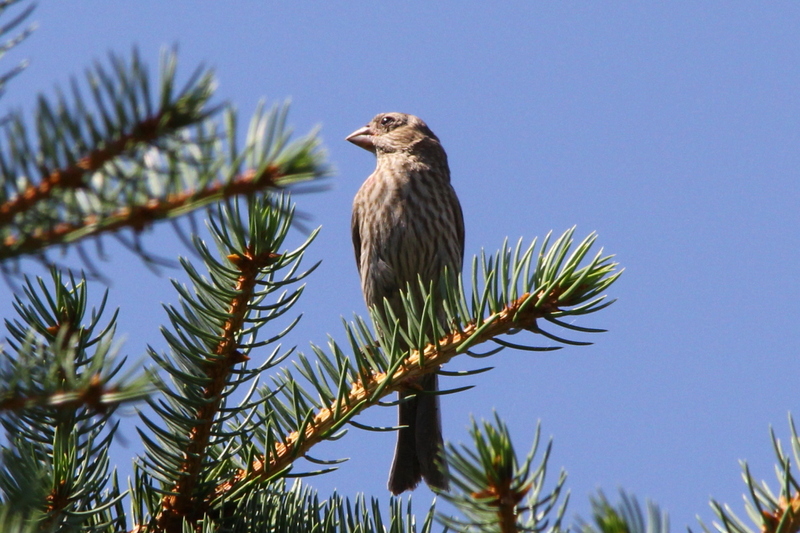 House Finches forage on the ground or in vegetation normally. They primarily eat grains, seeds and berries, being voracious consumers of weed seeds such as nettle and dandelion, included are incidental small insects such as aphids. 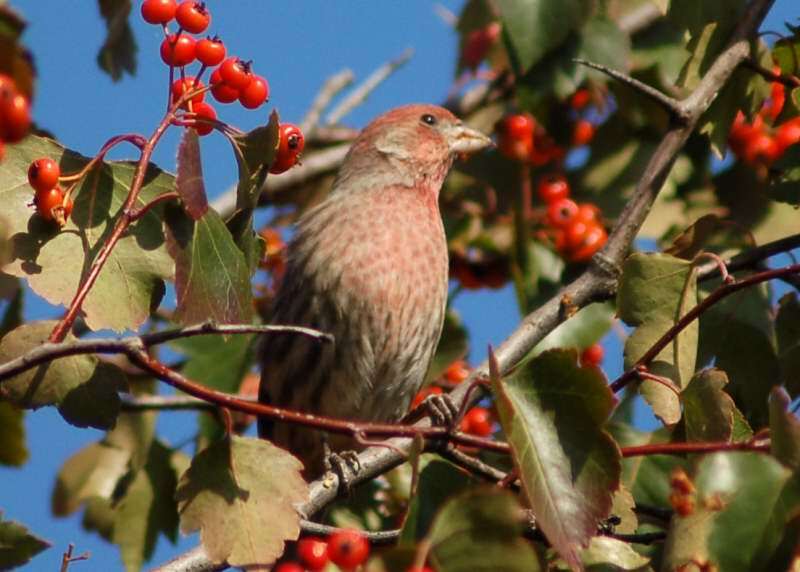 They are frequent visitors to bird feeders throughout the year, particularly if stocked with sunflower or nyjer seed, and will congregate at hanging nyjer sock feeders. Dandelion seeds are among the preferred seeds fed to the young. 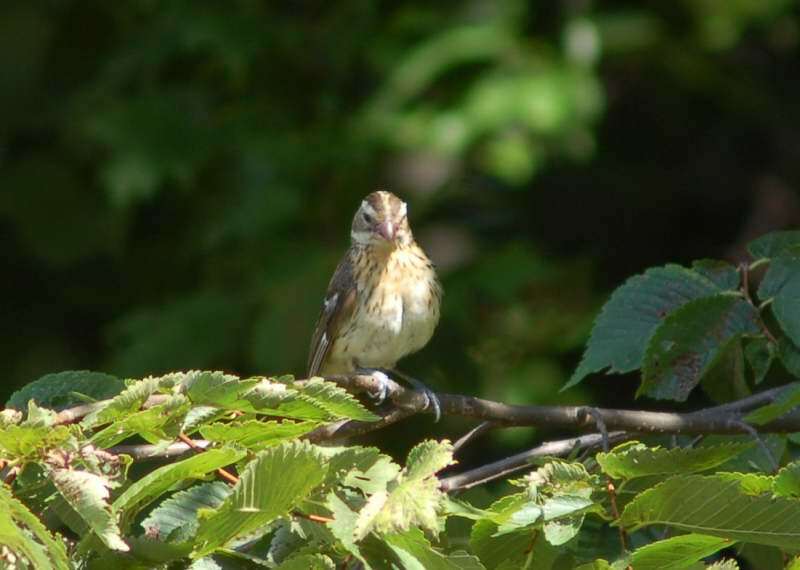 Most birds, even ones with herbivorous leanings as adults, tend to feed their nestlings animal matter in order to give them the protein necessary to grow. 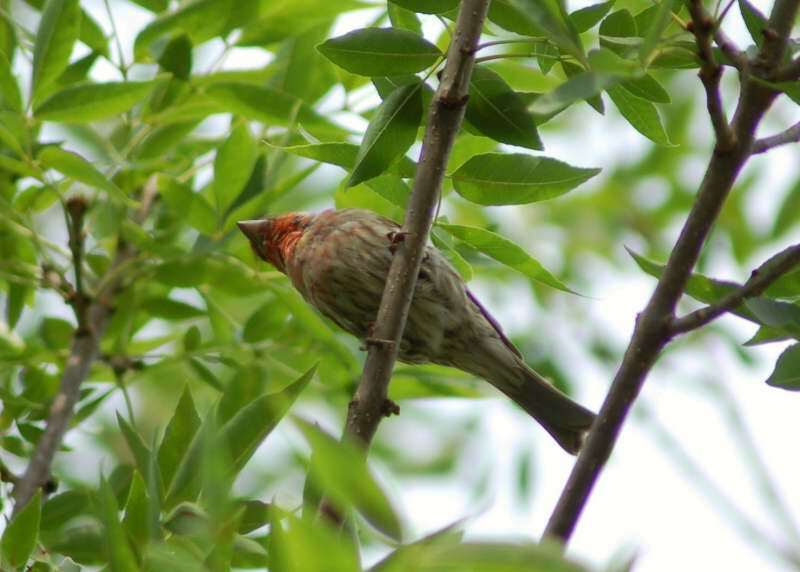 House Finches are one of the few birds who feed their young only plant matter. This is number 42 in my photo life list, only 308 to go! 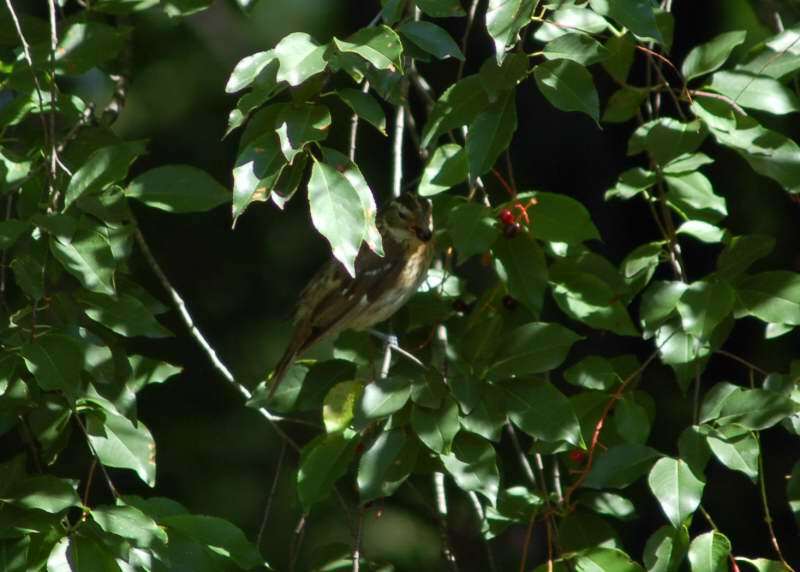 In eastern North America, Chipping Sparrows breed in woodlands, farmlands, and suburban and urban districts. 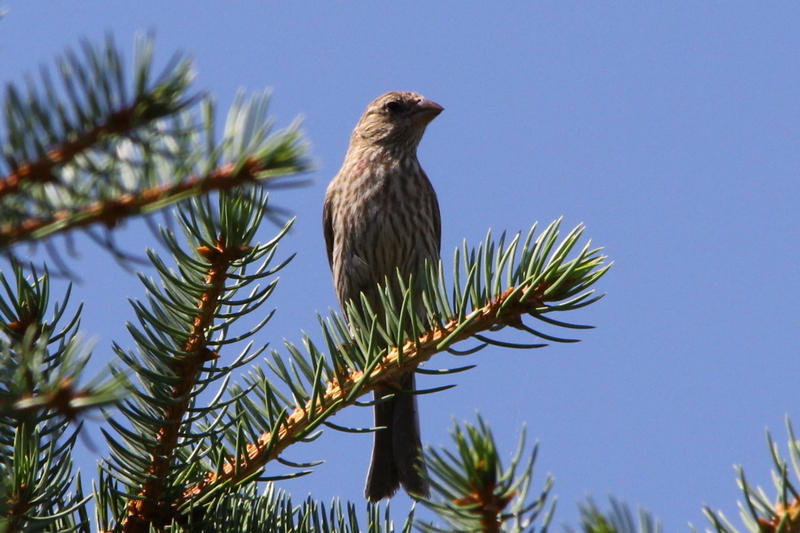 In western North America, the Chipping Sparrow prefers conifer forests for breeding. 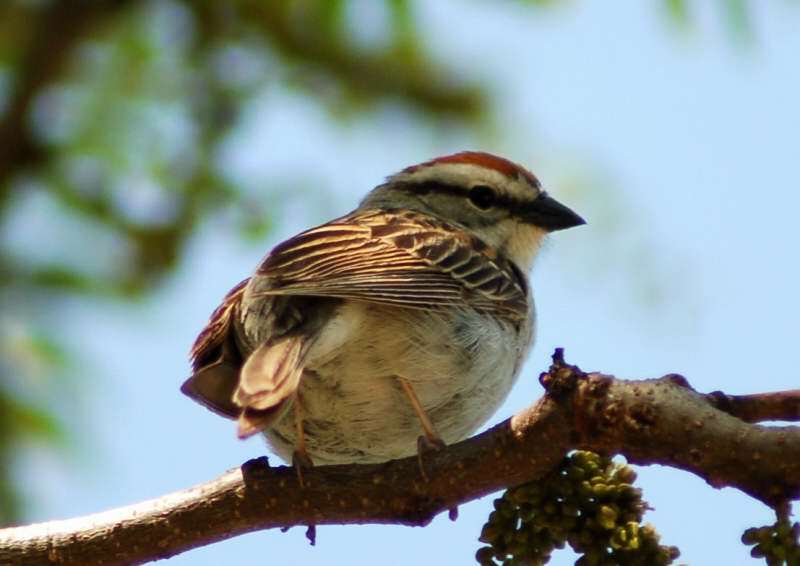 The Chipping Sparrow is partially migratory, with almost all mid-latitude and high-latitude breeders withdrawing in winter to the southern United States and Mexico. 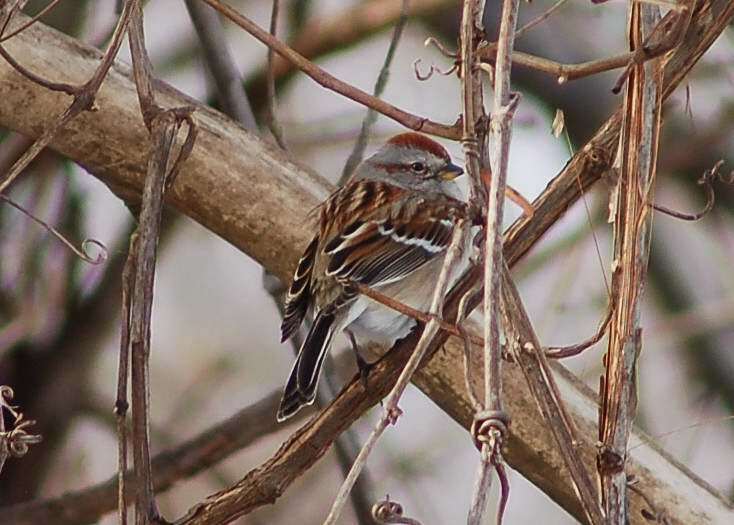 On the wintering grounds and during migration, Chipping Sparrows are gregarious, forming tight flocks with other Chipping Sparrows or loose assemblages with other species such as Eastern Bluebirds and Pine Warblers. 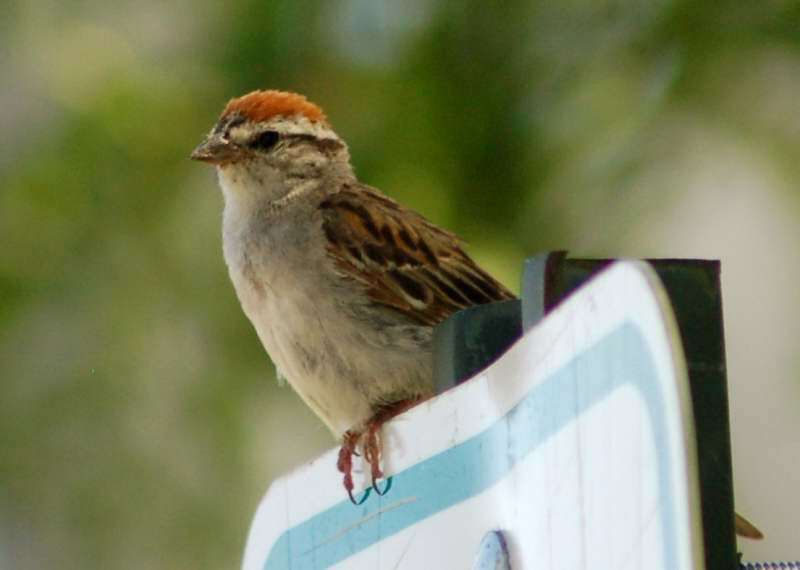 Throughout the year, Chipping Sparrows forage on the ground, often in loose flocks. Their diet consists mainly of seeds and crumbs of mostly any food, especially those fallen on the ground. Chipping Sparrows frequently forage directly from forbs and grasses, too. 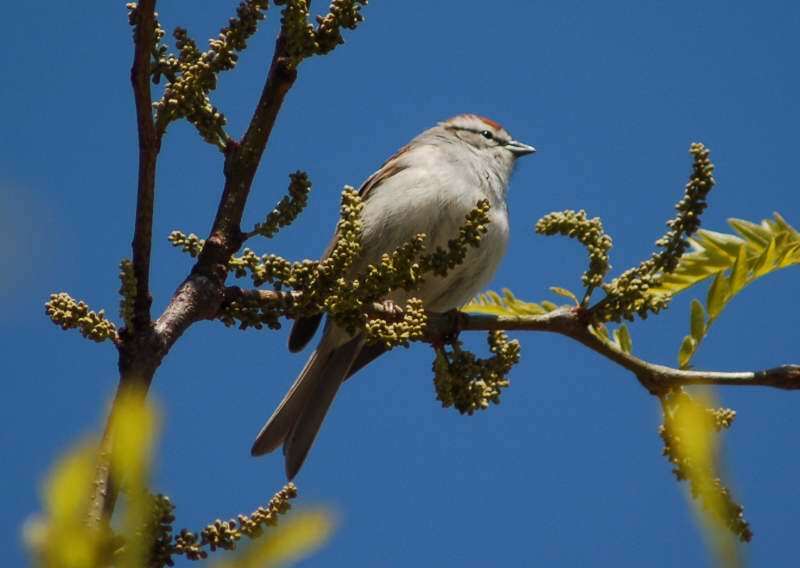 At any time of the year, especially, in spring, Chipping Sparrows may be seen in trees, even up in the canopy, where they forage on fresh buds and glean for arboreal insects. Although they are wary, Chipping Sparrows often allow close approach. 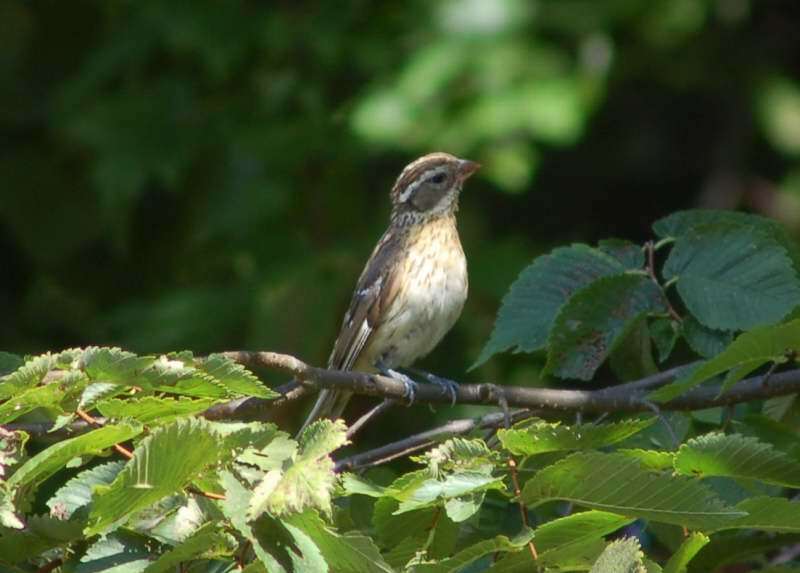 A quiet observer can often get to within 50–100 feet of one or more Chipping Sparrows feeding on the ground. 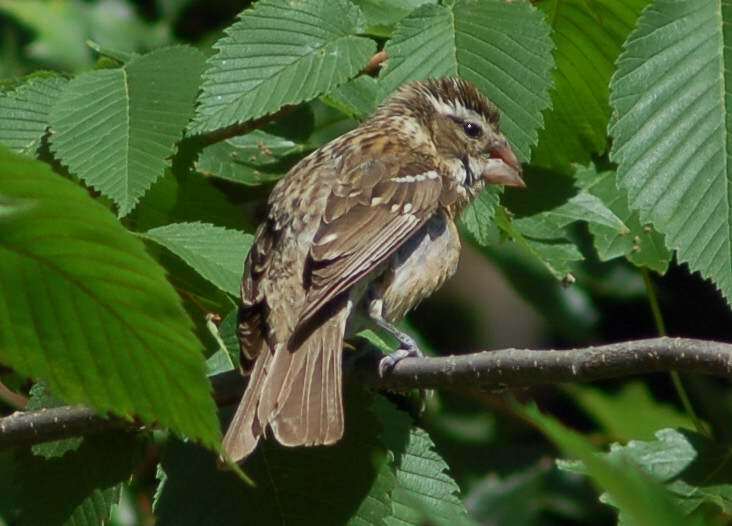 When spooked, Chipping Sparrows fly a short distance to the nearest tree or fence row. 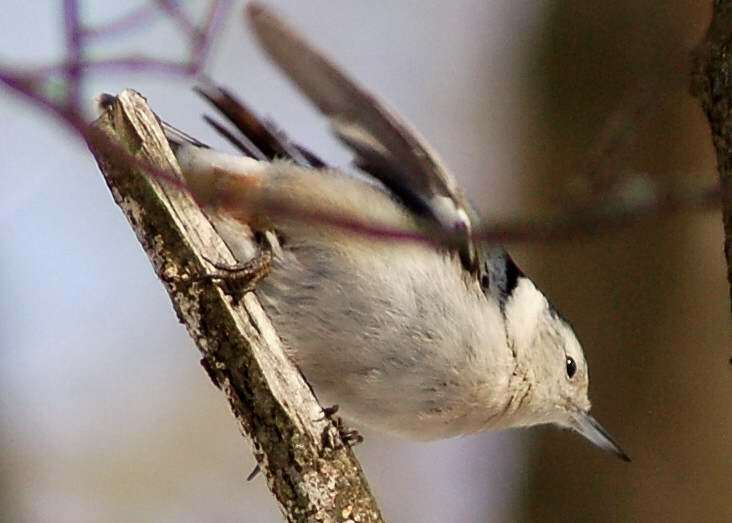 In early spring, the first migrants return from their wintering grounds in March, but the bulk of migrants arrives throughout April. 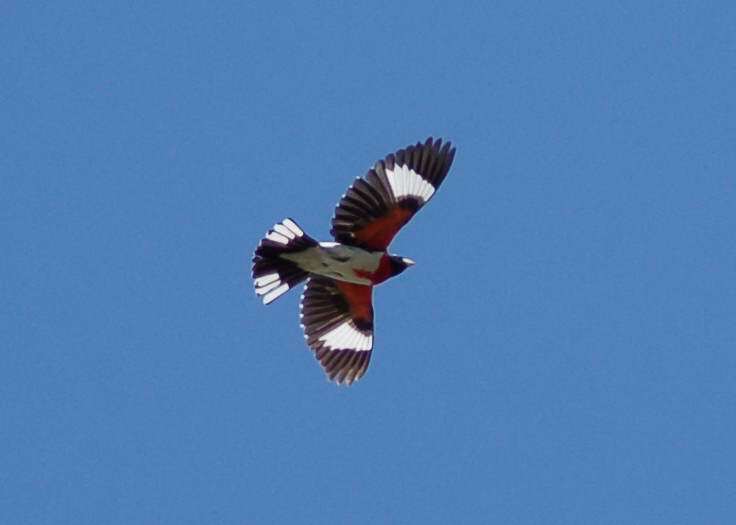 Males set up territories right away, and their trilled songs make them conspicuous. 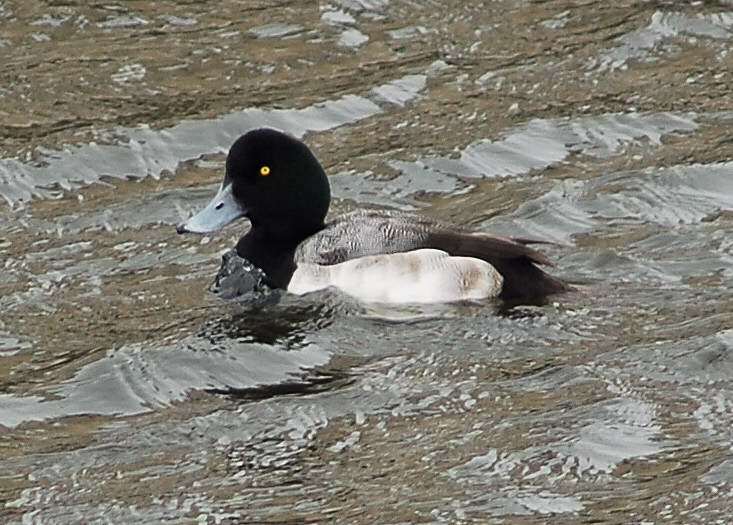 Breeding begins as early as April, but again, most nesting activity occurs from late April to early May on. 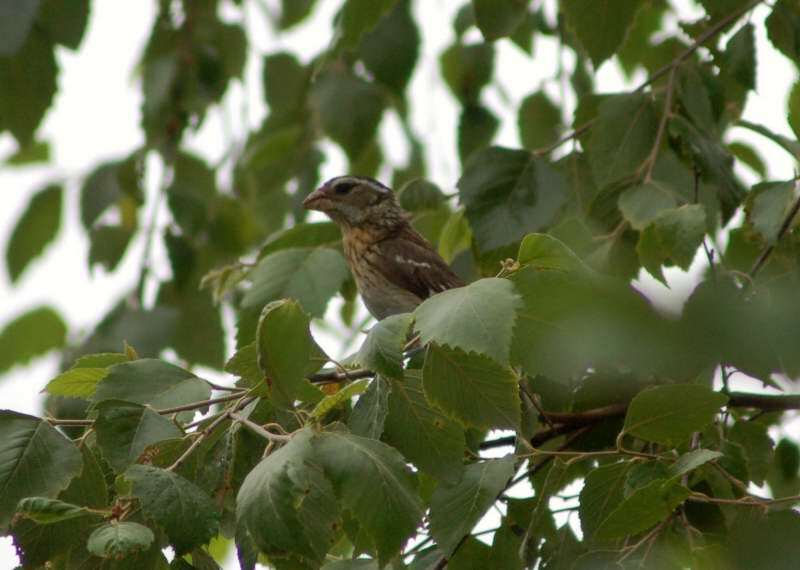 Molt in the Chipping Sparrow follows the “Complex Alternate Strategy” as usual for American sparrows. 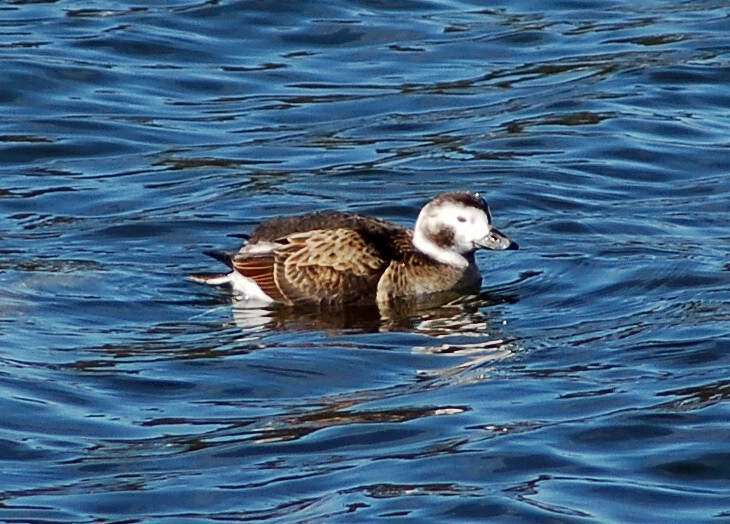 It consequently has two molts per year as adults and three molts in their first year of life, also called their first plumage-cycle. The Chipping Sparrow’s two adult molts occur in late summer and late winter. 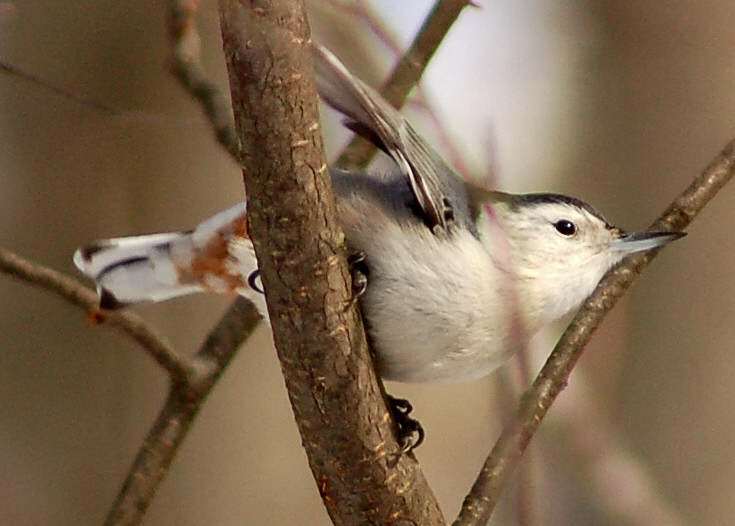 Although this bird’s original habitat was probably coniferous forest, especially the eastern subspecies has adapted well to the changes brought about by increased human population in its range. This is number 41 in my photo life list, only 309 to go! 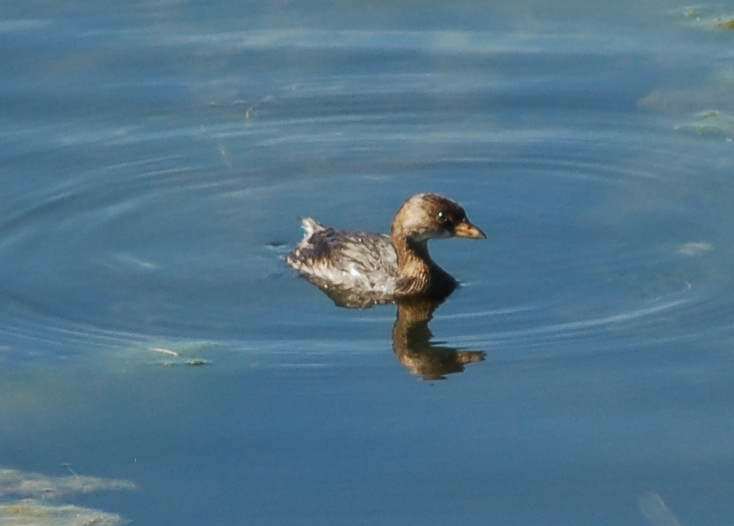 The Pied-billed Grebe is a small, shy grebe that prefers to dive rather than fly to escape danger. 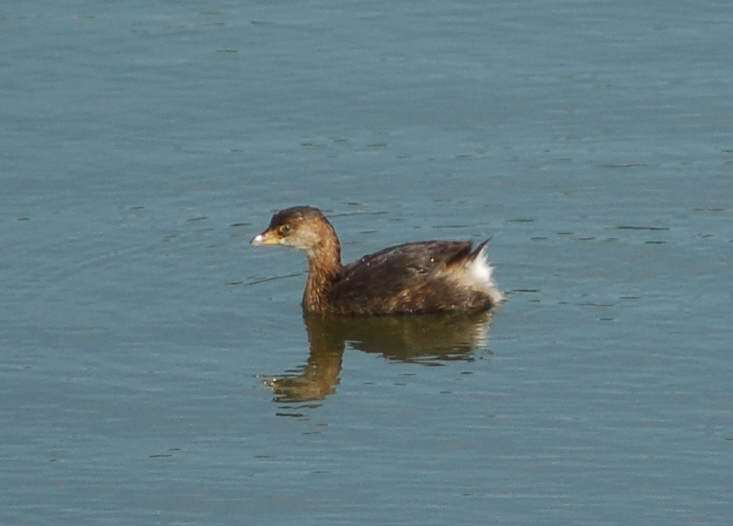 Pied-billed Grebes rarely fly. They make a slow dive frequently, especially when in danger, diving to about 20 feet or less. 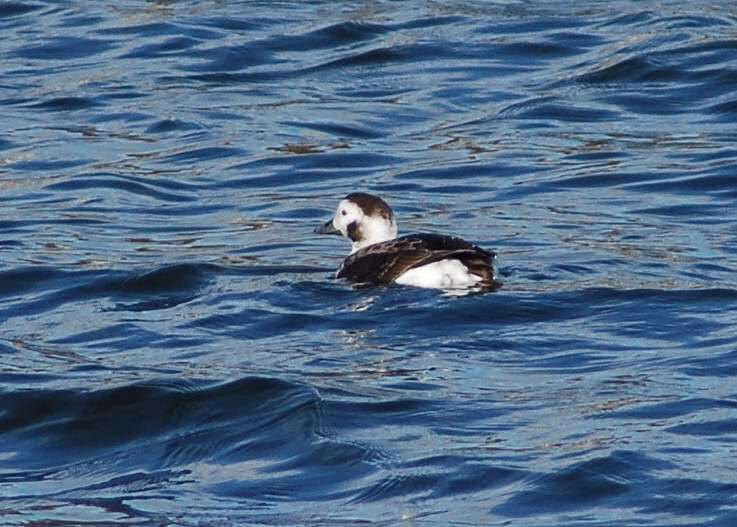 They dive for about 30 seconds and may move to a more secluded area of the water, allowing only the head to be visible to watch the danger dissipate. This frequency in diving has earned them the description of being reclusive or shy in nature. 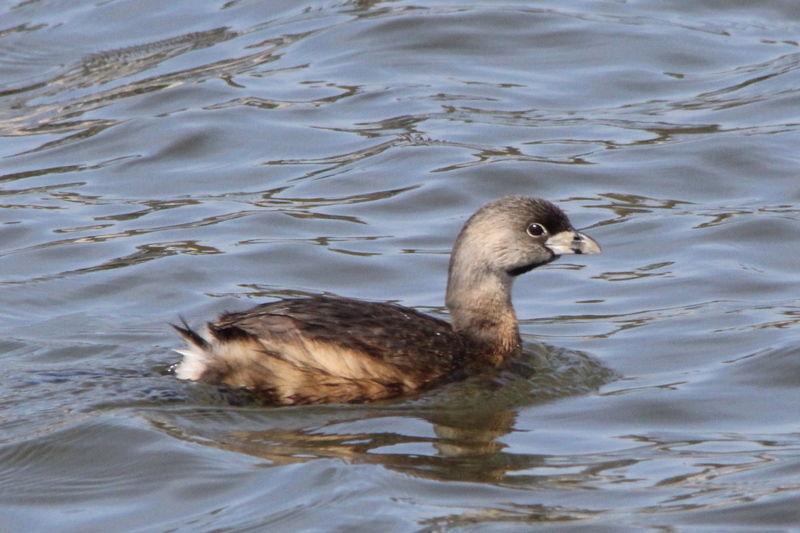 The Pied-billed Grebe is primarily found in ponds throughout the Americas. 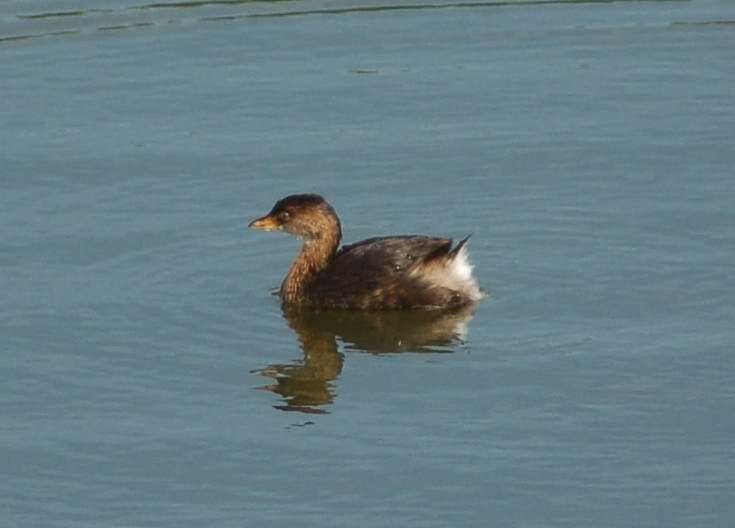 They are found in freshwater wetlands with emergent vegetation, such as cattails. 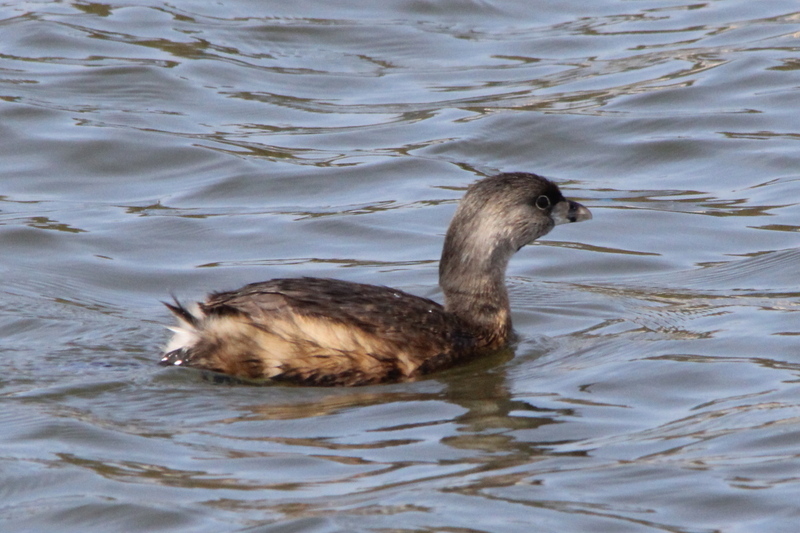 Pied-billed Grebes feed mainly on aquatic invertebrates, and also on small fish and amphibians (frogs, tadpoles). 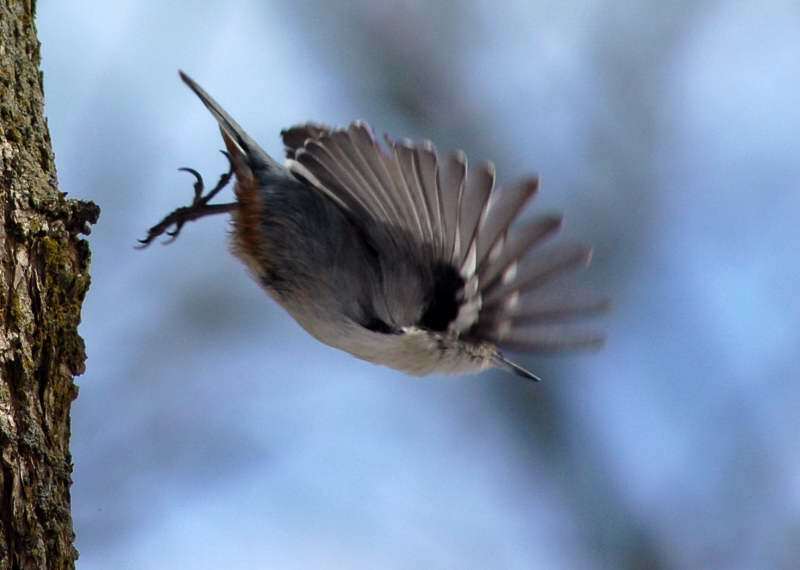 They dive to obtain food. 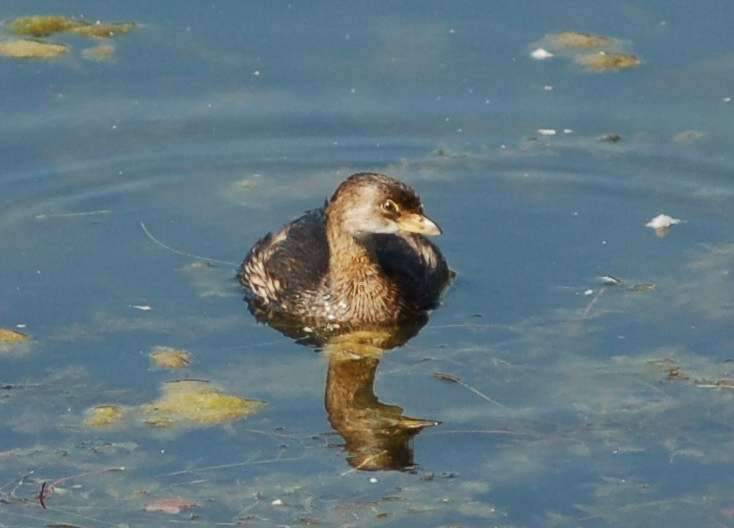 This grebe does not have webbed feet. Its toes have lobes that come out of the side of each toe. These lobes allow for easy paddling. Their bills allow them to crush crustaceans, like crawfish. They may also eat plants. 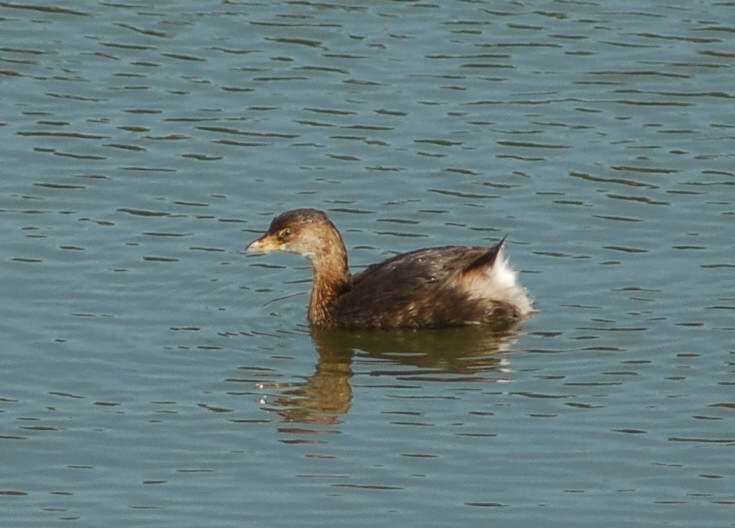 They have been shown to eat their own feathers, like other grebes, to aid in digestion (prevent injury from small bones). They will also feed their feathers to their young. They are extremely sensitive to disturbances, especially by humans. 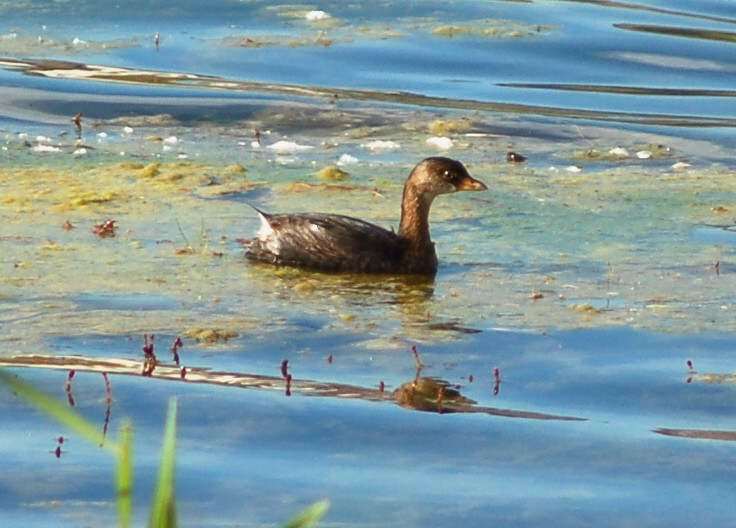 While breeding, if scared, adults may abandon their nests without protecting the eggs. The waves from boats can destroy the nests and their sounds easily frighten the birds. 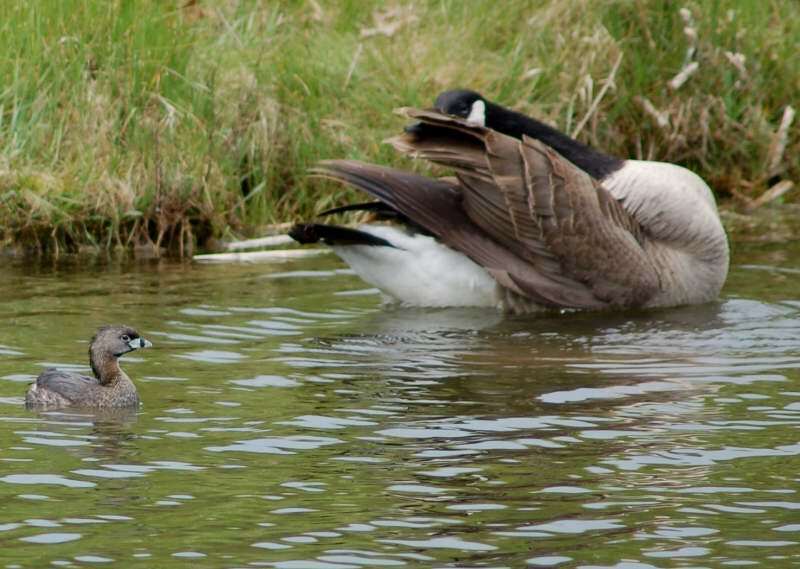 I am including a photo of a pie-billed grebe next to a Canada goose to give you an idea how small that these grebes are in relation to the goose, and I doubt that any one would mistake which is which in this photo. This is number 40 in my photo life list, only 310 to go! A couple of posts ago, I warned every one that I was going to start dumping a number of posts in my Photo Life List project all at once. But, as I was pounding them out yesterday after my walk, a funny thing happened. As I was approaching 50 posts in the series saved as drafts, I felt a growing sense of accomplishment first, then, a very strong sense of pride as well. 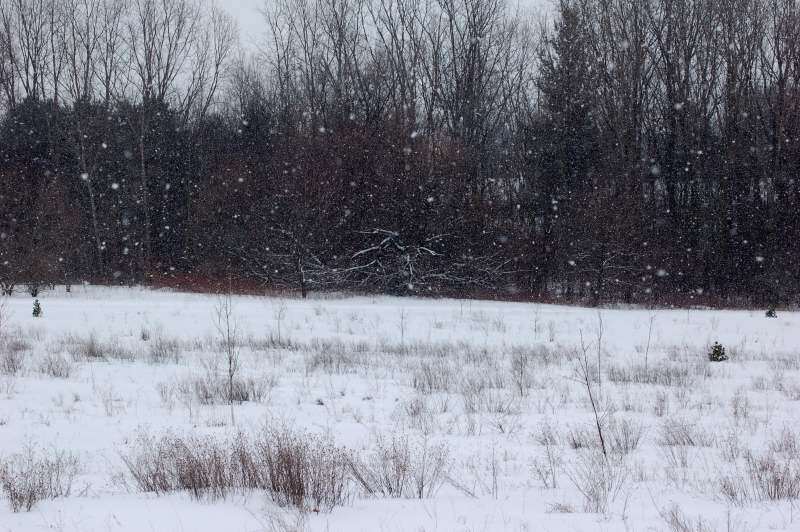 Before I go on about that, I have a few photos from my daily walk during our non-stop lake effect snow event. Anyway, back to my sense of accomplishment and pride. That really kicked in when I saved the 50th in the series, I feel like I am making real progress, I am now over 1/7th of the way done with this project. Posting photos of 50 species of birds is really not a great accomplishment in the grand scheme of things, there are many wildlife photographers who can say that. Heck, if you went back through all my posts to this blog you’d see photos of around 100 species. However, I’m working from just a few months worth of stored photos, along with photos taken since I began this project. But, it’s more than just numbers, as the old saying goes, if something is worthwhile doing, then it’s worth doing right. As I was working on the drafts, I was thinking to my self that some of the people who regularly read my blog may be interested in some of the tidbits of info that I have posted in some of the completed drafts, in fact, I’m sure that they will be. Birds are fascinating creatures, and I’m learning a lot while working on this project. I may be cheating in a way, I use several online sources for the information, then copy and paste bits of the info into my drafts to save me the time of typing it, then edit, rearrange it, then put it all together in a way that makes sense. My posts won’t be scholarly works, but I think that many people would find useful things to know about the individual species. Then, there are my photos. I know that I am overly critical of the photos that I take. This was driven home to me when I was looking up the information on the species that went along with my photos. I’m not saying that my photos are great, but they aren’t as bad as I was telling myself. 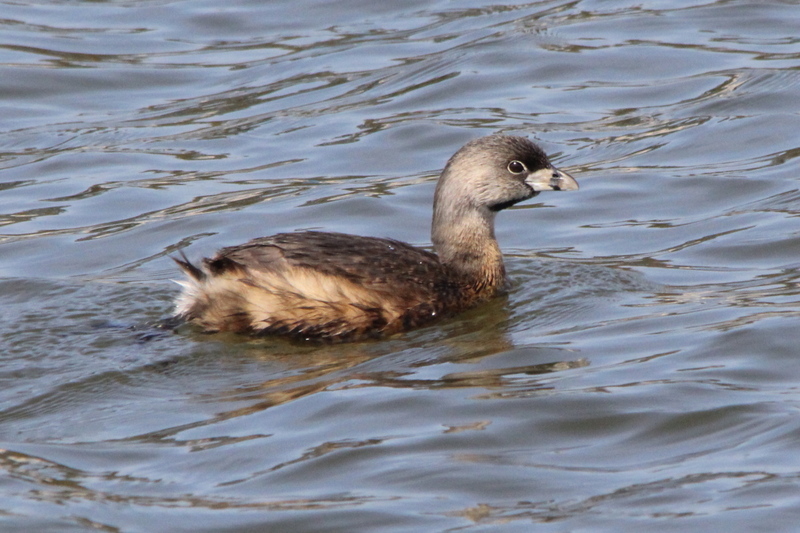 I have photos that are at least as good as many posted to the online birding guides. Maybe not for every species that I have completed so far, but overall, I think that I do OK. They deserve better than to be just dumped out there in bulk. 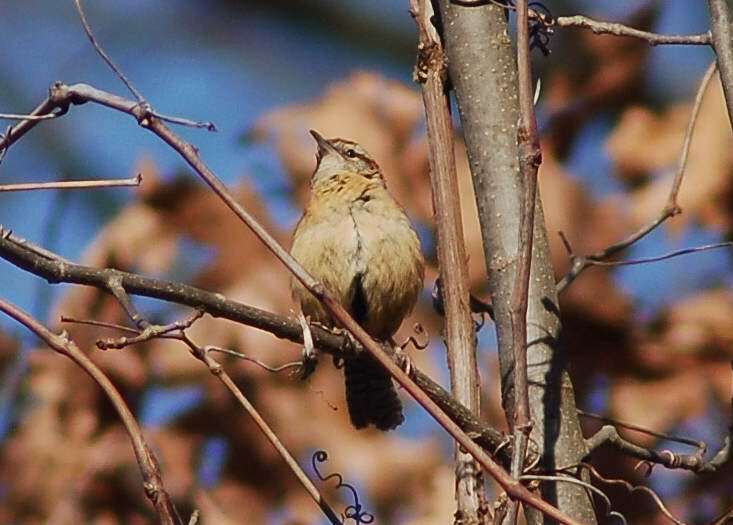 Yes, there are a few clinkers, more than I would like, such as in the post on Carolina wrens that I just posted. 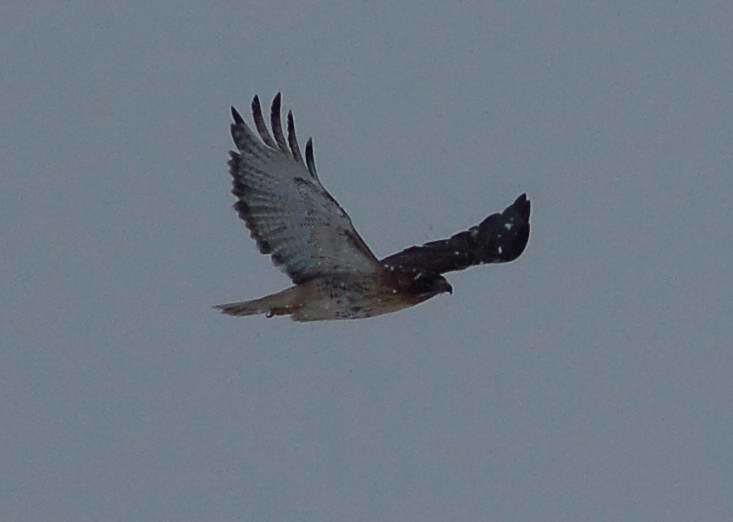 But, that’s part of birding and wildlife photography, you can’t always get very good shots. I am under no illusions or delusions about the quality of photos that I’m inserting in these posts, there isn’t a single one that is earth shattering as to command every one’s attention. The same holds true of the individual posts in the series, none of them are all that special. However, the magnitude of this project is just beginning to really hit me. Even if I never finish this project, and I doubt that I will, the entire body of work that I am generating is something special when taken as a whole, if to no one else, it is to me. I may not end up with a rival to an Audubon field guide, but I’m doing this on my own. There are few people willing to take on a challenge like the one that I am working on, I think that I should be proud of what I’m accomplishing, and that I shouldn’t be so dismissive of my own efforts all the time. So, what this all boils down to is this. I’ve changed my mind, I’m not going to dump a dozen posts in a day or two, I’m going to continue on at one a day or so, depending on my mood, the quality of the post and other things. Even though I am anxious to get as much done as quickly as I can, what good is it if no one looks at what I’m doing? I have also realized that getting the photos inserted into drafts is helping me clean out my computer, when a post is saved as a draft, there’s no need for me to hold on to the photos for that draft. And, there’s something to say for having several week’s worth of posts already saved as drafts. That way, I can put more time and effort into improving the series even more. I say in the blurb in the beginning of the posts in the series that it isn’t intended to be a field guide, but in reality, that’s what I am building in the long run. I think that I am entitled to take a little pride in that. Well, it had to happen, I knew that it would at some point in this series. 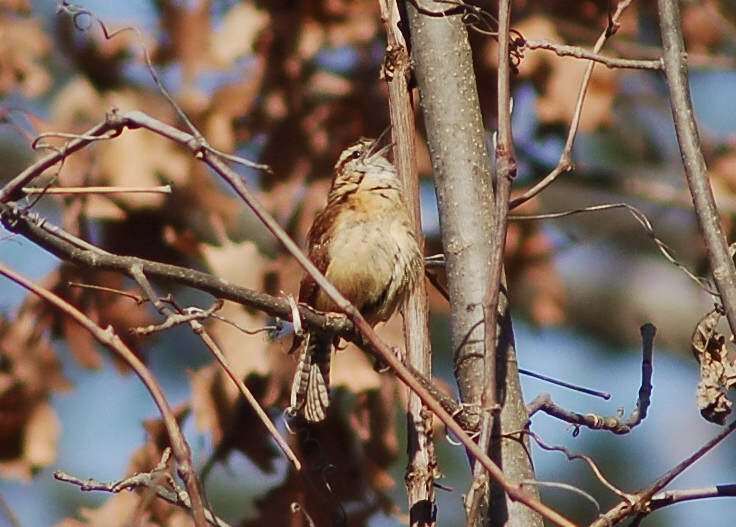 On Sunday, February 17, 2013, while walking in a local county park, I spotted a carolina wren, but the photos I got are less than great, as you will see. The photos do meet my minimum, self-imposed standard of being good enough to make a positive ID, but they’re not photos that I would normally post in this series. 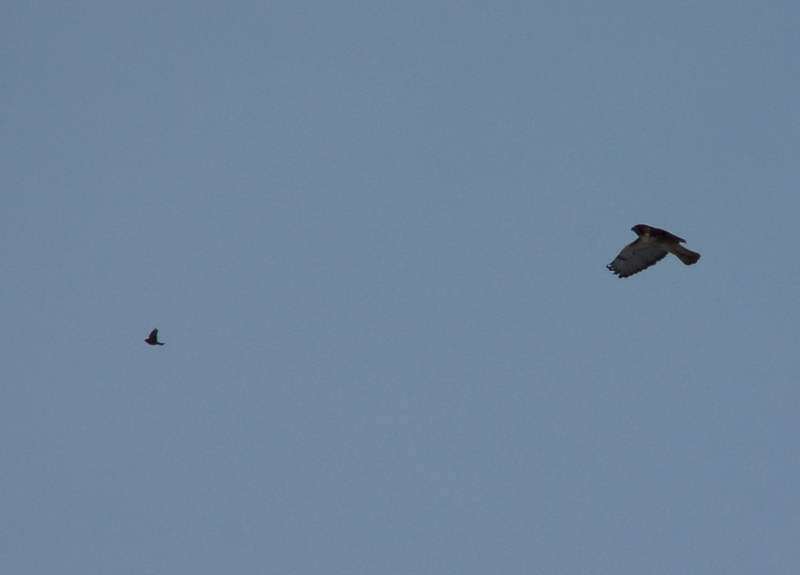 But, what is one to do when they see a somewhat rare bird, and bad photos are all one can manage? Before I continue that train of thought, here’s some info about Carolina wrens from Wikipedia, which will help me fill in the blanks later. 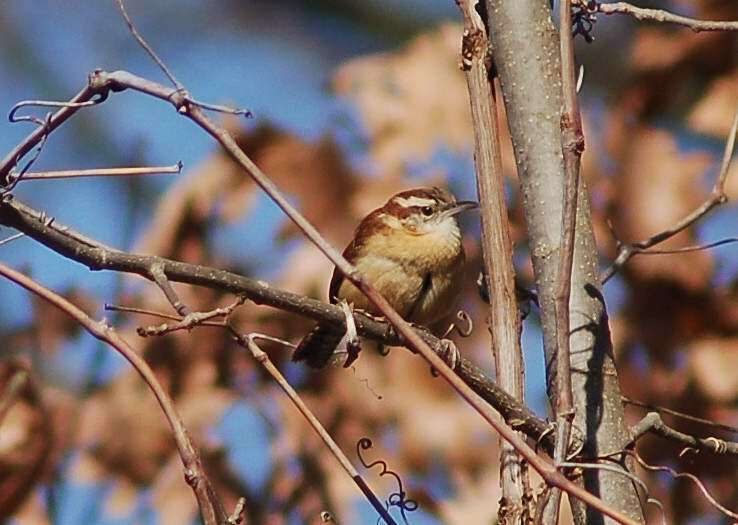 “The Carolina Wren is sensitive to cold weather. Since they do not migrate and stay in one territory. 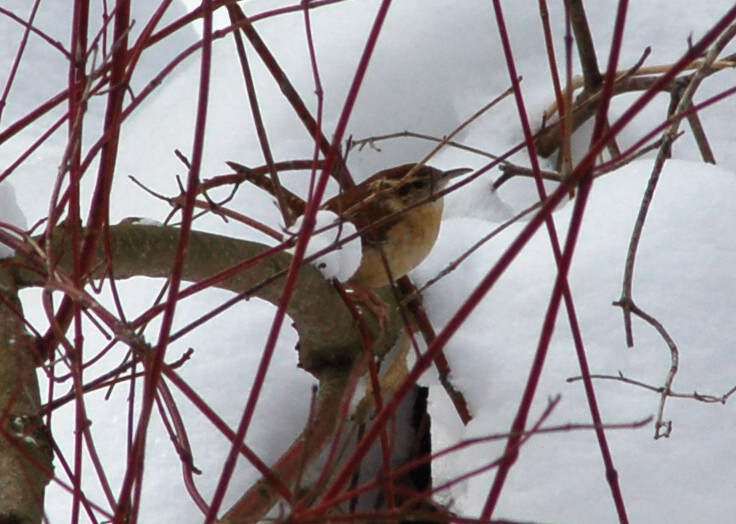 The northern populations of Carolina wrens decrease markedly after severe winters. Because of this sensitivity to weather, gradually increasing temperatures over the last century may have been responsible for the northward range expansion seen in the mid 1900s. 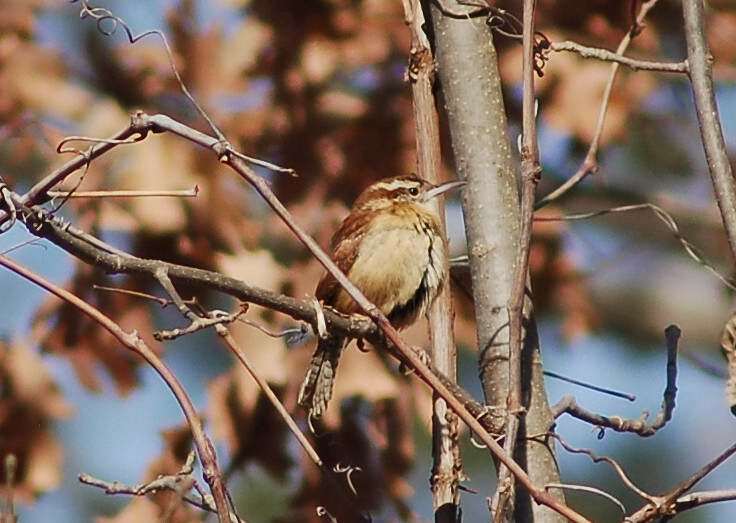 According to both Wikipedia and the Cornell Lab of Ornithology “All about birds” website, Carolina wrens are not residents of the area where I live. 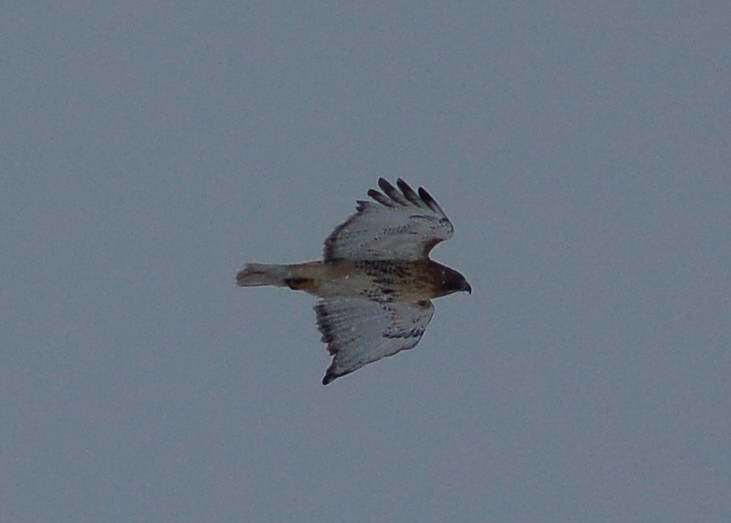 I thought that I was going to have to travel to the southeast corner of Michigan to have any hopes of spotting one. 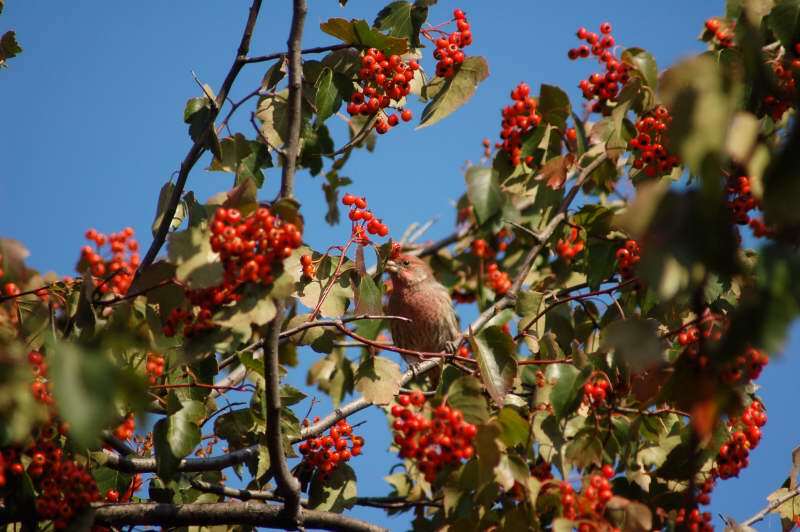 But, during my walk, I heard an unfamiliar bird call, and then spotted the bird making the call. However, it was buried deep within the branches of the brush along a creek. 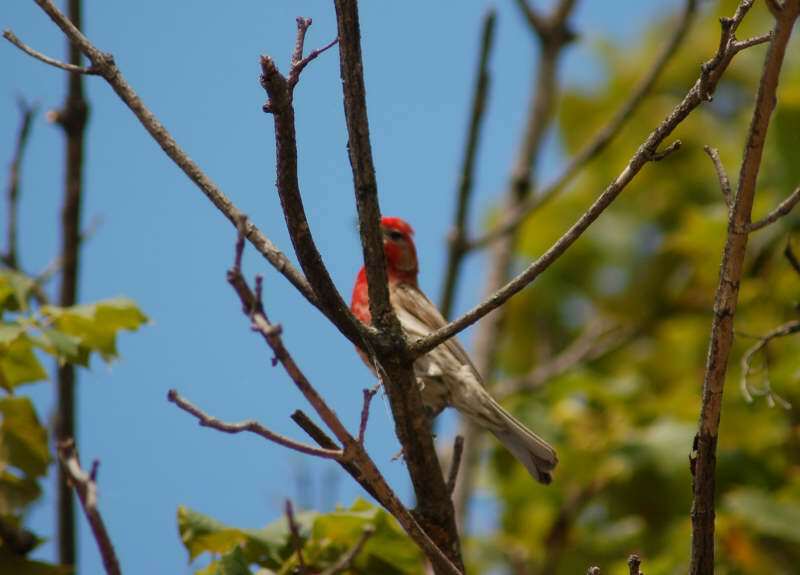 No way that the auto-focus of my camera could get a lock on such a small bird with all that brush between us. To make matters worse, like all wrens, this one was always moving, and quickly. After several failed attempts to get a photo, including the “Hey, it was there just a split second ago” shots of empty branches, I hatched an idea. Luckily, there was enough sunlight for a change to make this almost work. I switched to manual focus, set the aperture to f/14 to give me the greatest depth of field that I could get under the conditions, and managed two not so good photos of the wren before it flew off out of sight. Here they are, in all their inglorious badness. Switching to manual focus meant that I was more or less shooting one-handed, as it’s hard to steady the camera when you left hand is spinning the focus control like crazy trying to keep up with a hyper wren. 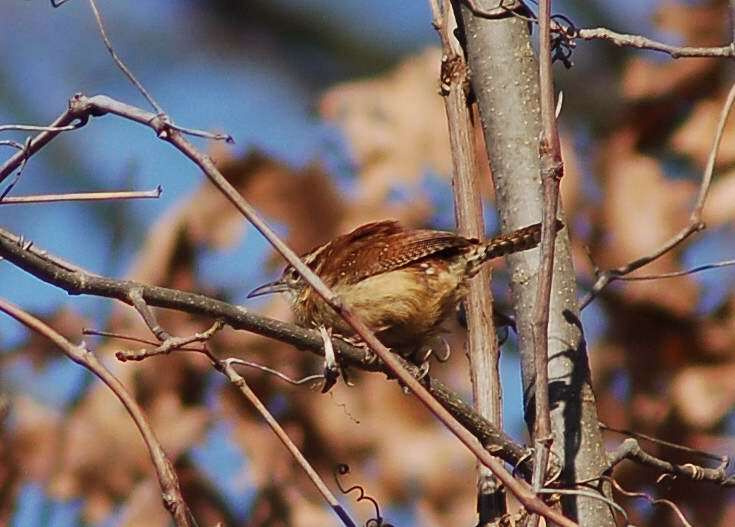 The slow shutter speeds with the lens stopped down didn’t help either, but, the increased depth of field gave me a better chance of getting the wren at least somewhat in focus, and at least I got something recognizable as a Carolina wren. 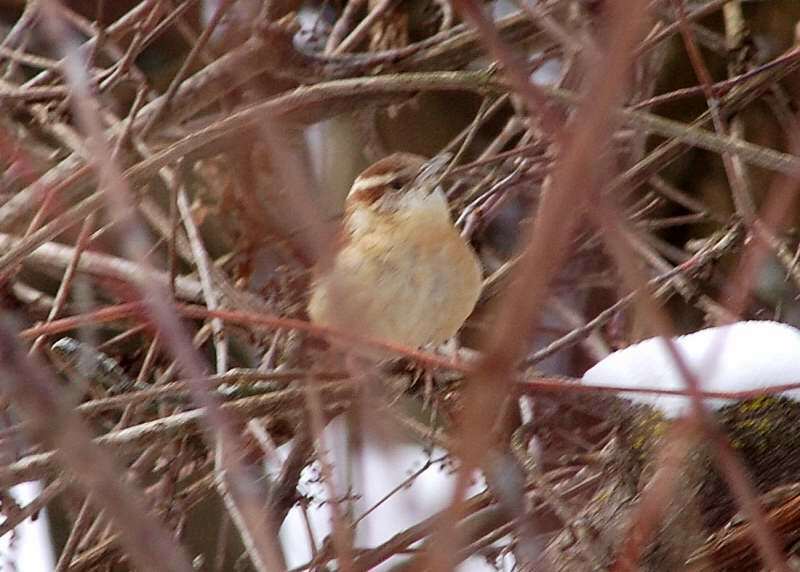 If the experts are correct, and these wrens are expanding their territory northward, I may get chances in the future to replace these photos with better ones, I sure hope so, but who knows when that could be? Since this is not only is this an entry in my photo life list, a Carolina wren is a regular life list first for me as well, I feel it is important enough to post these photos now, rather than hope I get better ones later on. 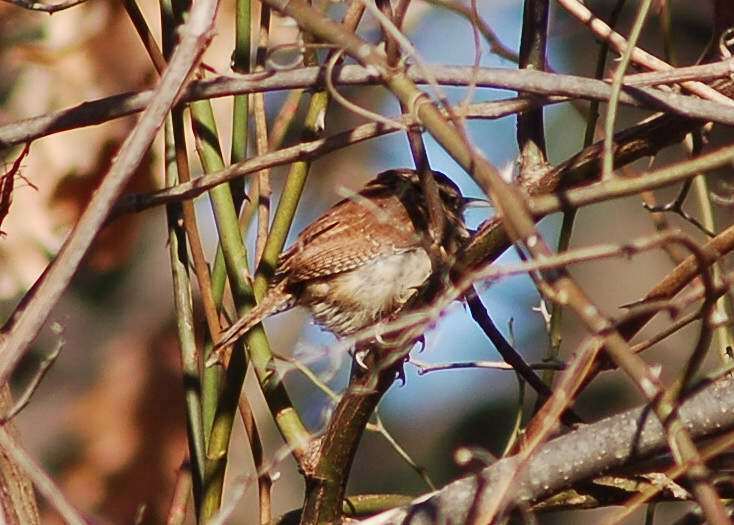 Of course I have noted where I saw the wren, and it was in a park that I walk through at least once a month, I will return to the spot where I saw the wren in hopes of seeing it again for better photos. March 17, 2013, better photos added. This is number 38 in my photo life list, only 312 to go! 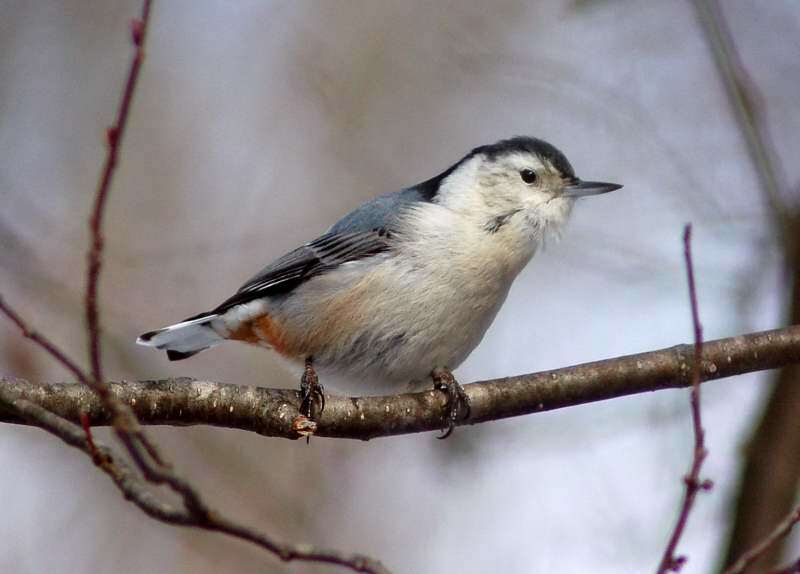 The White-breasted Nuthatch (Sitta carolinensis) is a small songbird of the nuthatch family which breeds in old-growth woodland across much of temperate North America. 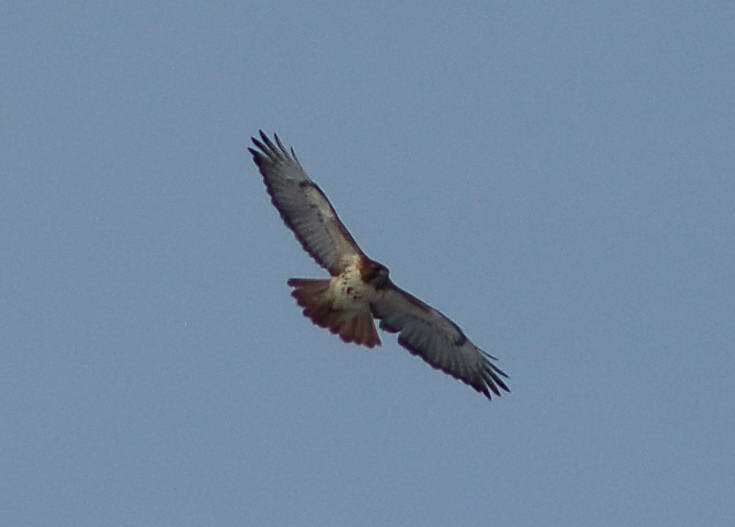 It is a stocky bird, with a large head, short tail, powerful bill and strong feet. The upper parts are pale blue-gray, and the face and underparts are white. 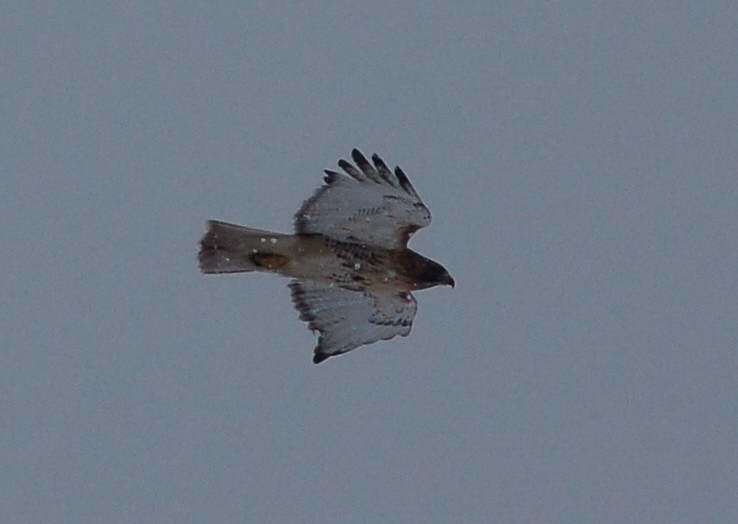 It has a black cap and a chestnut lower belly. 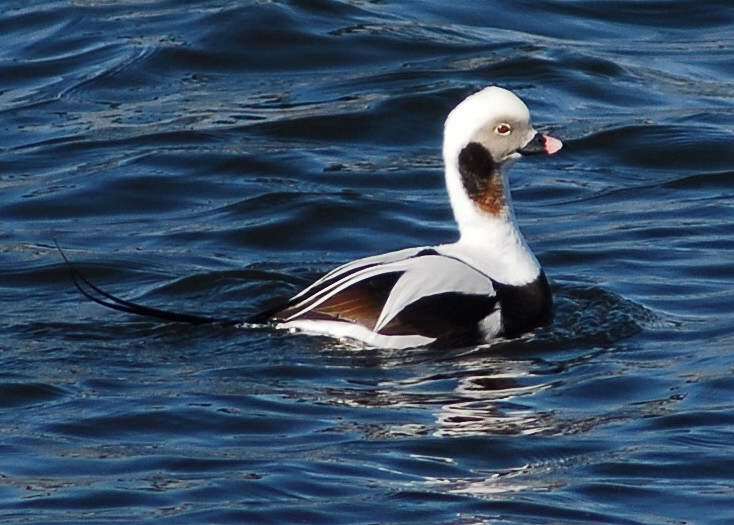 The nine subspecies differ mainly in the color of the body plumage. 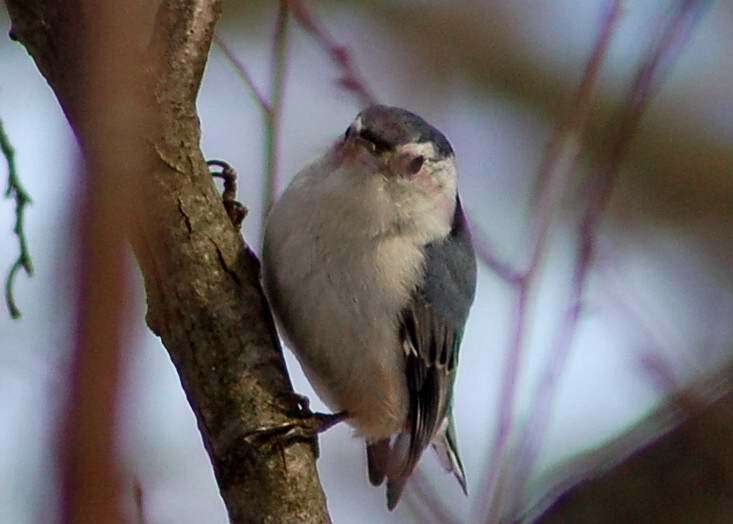 The White-breasted Nuthatch often travels with small mixed flocks in winter. 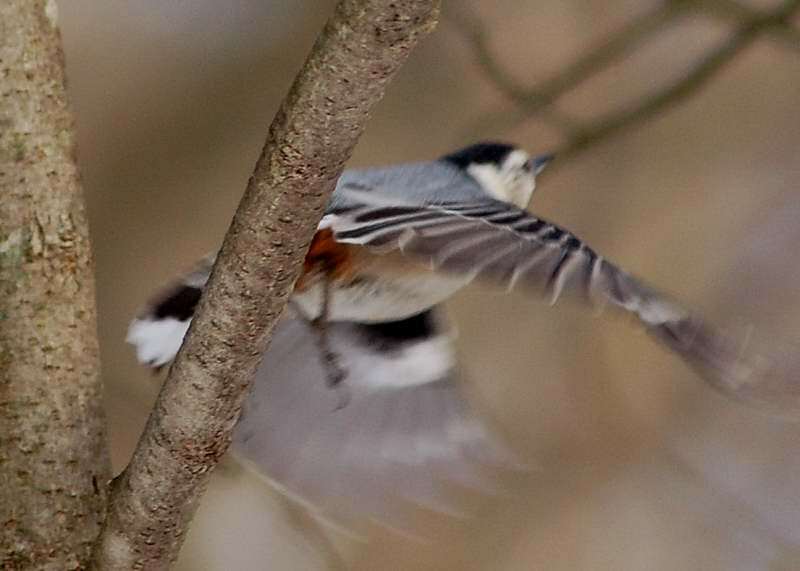 These flocks are led by titmice and chickadees, with nuthatches and Downy Woodpeckers as common attendant species. 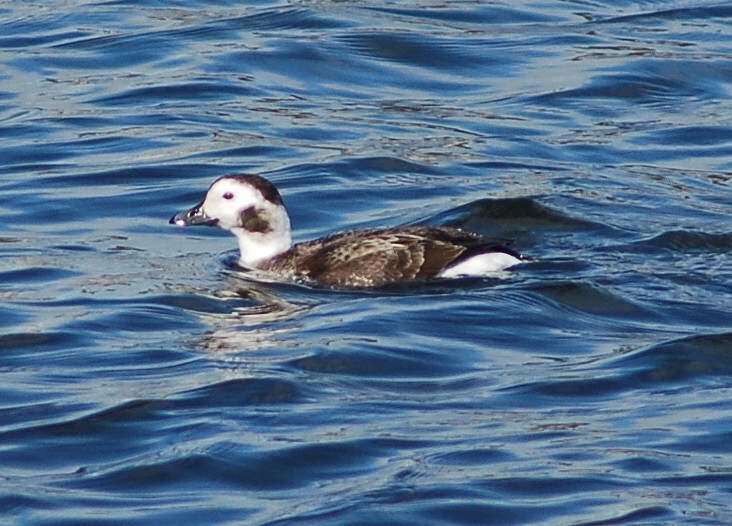 Participants in such flocks are thought to benefit in terms of foraging and predator avoidance. 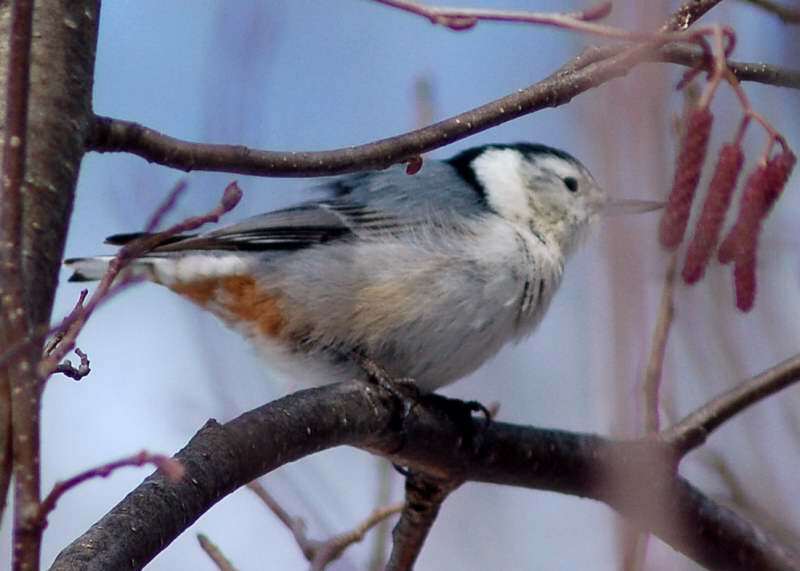 It is likely that the attendant species also access the information carried in the chickadees’ calls and reduce their own level of vigilance accordingly. 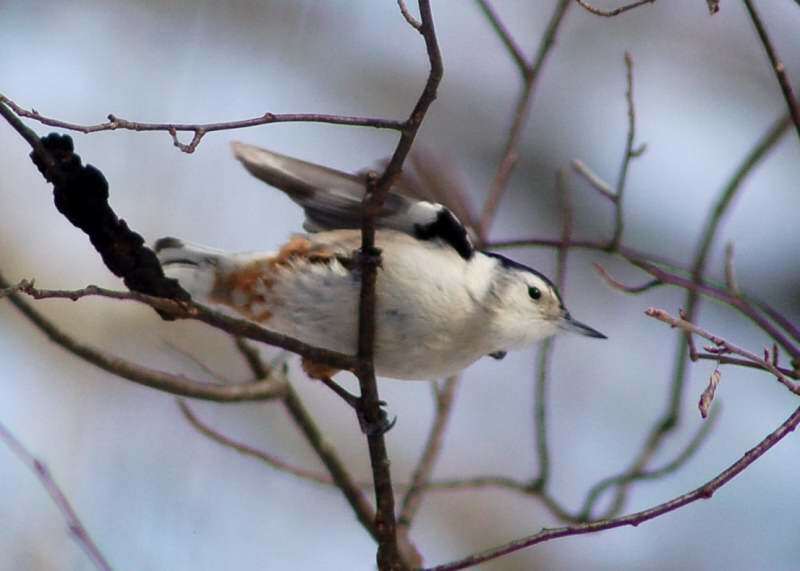 The White-breasted Nuthatch is monogamous, and pairs form following a courtship in which the male bows to the female, spreading his tail and drooping his wings while swaying back and forth; he also feeds her morsels of food. This is number 39 in my photo life list, only 311 to go! I’m really chomping at the bit to get as many posts in my photo life list project posted as I can, but for the most part, I’ve been limiting myself to one per day. Before I expound on that, I have started another blog where I am going to post only the very best photos that I have taken. I have done that as part of my plan in an attempt to earn a few extra bucks selling my photos. I doubt if I will ever make a sale directly off from the other blog, but it is part of an overall scheme. Anyway, you can find it here. I think that long time followers of this blog have already seen the photos there, but I have them displayed larger, and I haven’t reduced the quality as much as I do for the photos that I post here. Back to my life list project. 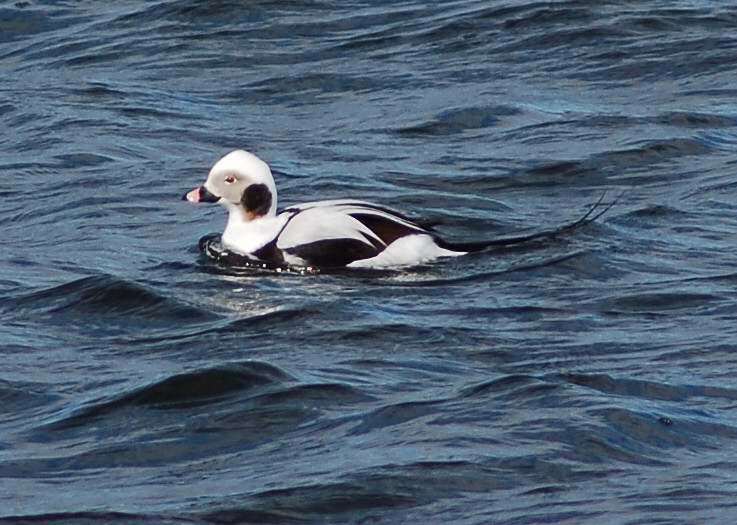 I still have a number of species that I can do a post on, but, if I do them now, they will be incomplete compared to what I would like them to be. But, that was my idea when I decided how I was going to do this project. It’s darned hard to keep hundreds of photos sorted and stored on my computer, waiting until I have very good photos of every species. I’d like to post what I have now, as I already accidentally deleted a few of the photos that I was storing. 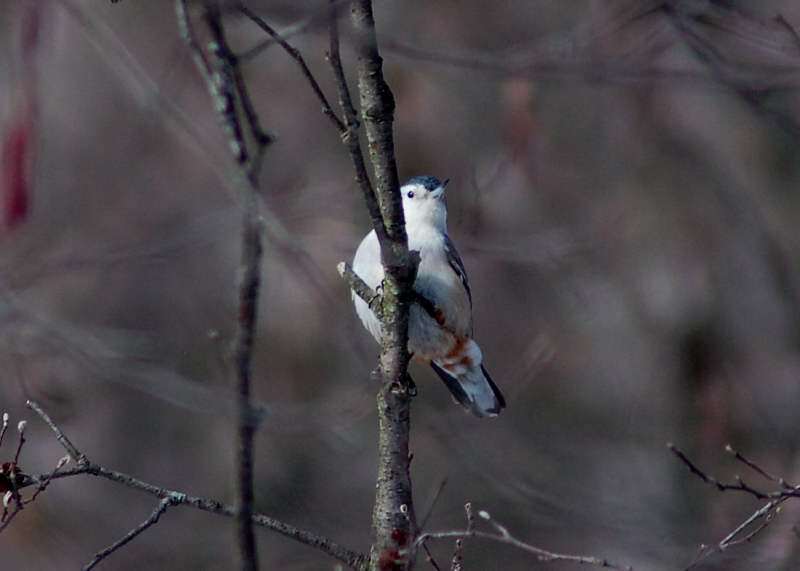 Luckily, they were of white breasted nuthatches, and I was able to shoot replacement photos the same week as I deleted my older ones. The way that I organized the project, using pages to navigate to the individual species posts makes it easy for me to find older posts, no matter how long ago it was posted, or how many posts I’ve done since. I did it that way intentionally so that I could continually update the older posts as I get better photos. I can easily knock off three or four posts in the series per day on the weekends, up till now, I do and save a week’s worth as drafts on the weekends, then publish one per day as not to dump multiple posts per day on my regular readers. However, since I began this project, I seem to have lost a few of the regular readers that I looked forward to receiving comments from. I’m not sure why that happened. I don’t know if it because of how often I’m posting, or for other reasons. I am tempted to pound out as many posts in the series as I have photos for right now, to get those done so that I can get back to my regular blogging. Today (Friday) I have reached a decision during my daily walk, but before I announce it, I have a few things to say about WordPress, blogging, and bloggers. First, WordPress, it’s great! I started my blog using a different platform, and found it very hard to use. Not so with WordPress, it is very easy to create an attractive blog, and they also make it easy to publicize your blog as well. However, one thing that is usually overlooked is that their motives are not totally altruistic, the survival of WordPress depends on our participation. It takes money to purchase and maintain the servers and hardware, it takes money to pay the wages of the developers and other employees. That’s one of the reasons that they push so hard for us to post more often, and to visit other blogs to build a following for our blogs. One of the ways that WordPress generates revenue is through the sale of ads which appear in our posts if we use the free version. The more often we post, the more ads WordPress can sell. Being a free market capitalist, I’m OK with that. I get a free platform for my blog, WordPress makes the money to pay for it by selling advertising space in my blog. No problem. So, (I have to quit starting sentences that way, I’m beginning to sound like an NPR liberal) where the problem lies is that, in my opinion, far too many bloggers take the WordPress tips for developing a following for their blog too far. How do I know that? I have a pretty good idea that when I click the button to publish this, then return to the dashboard, that this post will have received a “like” or two by the time that the dashboard has fully loaded on my old, slow computer. There’s no way that the person liking my post would have been able to read my entire post and determined that they did indeed like it enough to click the like button in that short of time. I have come to the conclusion that much of the traffic to my blog is false traffic, it is from other bloggers who view as many blogs as they can, and like or follow those blogs in order to generate more traffic to their own blogs. I can’t say as I blame them, that’s one of the tips from WordPress. Again, that tip is not totally altruistic, the more traffic on WordPress, the more that they can charge per ad. Again, I’m OK with that. For me, the problem begins when a blogger places too much emphasis on their site stats. I’ll admit, I check my blog’s stats from time to time, but I am really past caring about the overall numbers for the most part. What I do care about is what posts people are looking at, and why. Other than the traffic seekers, I can tell that most people who visit my blog find it through the search engines while looking for specific information. Those are the people I was aiming for when I began this blog way back when. One more thing before my big announcement, I do value those of you who do visit my blog for what I consider to be the right reasons. I think that you all know who you are, please don’t ask me to make up a list, because I’m sure I would forget one or two of you. I want to thank all of you with whom I have had conversations with through comments here, or on your blog! I hope that my announcement won’t drive you away permanently. So, my big announcement, and then the why I came to this decision. Look out folks, there’s going to be a major increase in the number of posts that I will be doing for a while, multiple posts per day for a while. I am going to post this, hopefully yet today, take a break over the weekend while I work on posts in my photo life list project, then start posting them as quickly as I can finish them, starting on Monday. Those of you have been long time readers can ignore those posts if you like, there won’t be any spectacular photos in them, as I have exhausted my very limited supply (6) of spectacular photos. The reason for doing this is that I have to get the number of photos I have stored ready to post down to a manageable number, I can’t keep sorting through hundreds of photos looking for the ones I want for a particular post. I’m already having trouble as far as what to do with new photos I am taking, it’s becoming a monster! Another reason for multiple posts is because of the way that I am made. Give me a project and/or a goal, and I dive in headfirst to get as much accomplished as quickly as I can. That always serves me in good stead in the business world, that may not hold true in the blogosphere, time will tell. 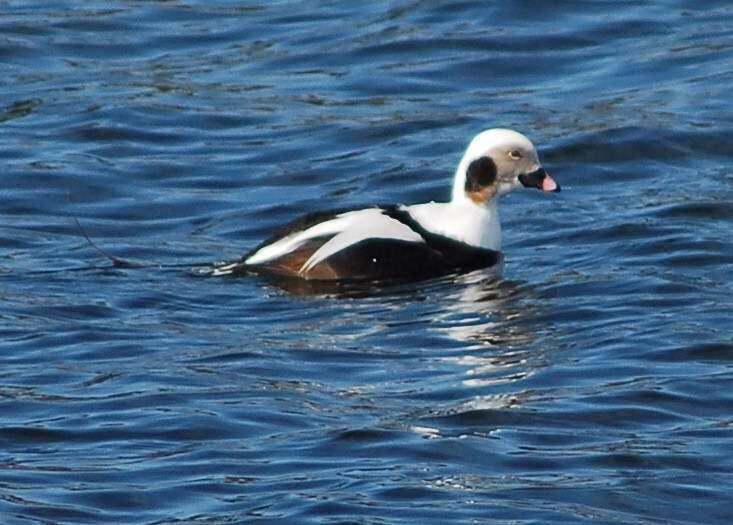 I want to get the species that I have photos of now posted, even if the posts are not as complete as I would like at the present time. At least I’ll have the posts as placeholders for my future photos, and room on my computer for new photos as I get them. 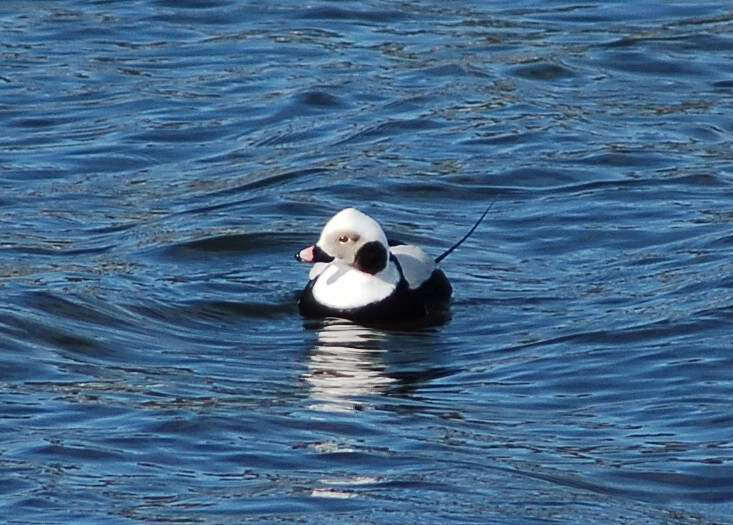 Another reason for doing as many of the posts in that series as quickly as I can is so that I can get back to what I consider to be the normal nature of my posts, and only do posts in the photo life list when I get photos of a species that I haven’t already done a post on. I also want to get as many of the posts at least started as I can right now, so that I’ll have time when the weather gets nice to do the kinds of things that I want to do, rather than doing those posts when I’d rather be outdoors enjoying spring here in Michigan. I am not going to be publishing all those posts just to drive up my site stats, I don’t give a rat’s rear end about my site stats, just so you know. I do apologize advance to those of you who truly follow my blog for what is about to hit you! I see no other good way to do it. 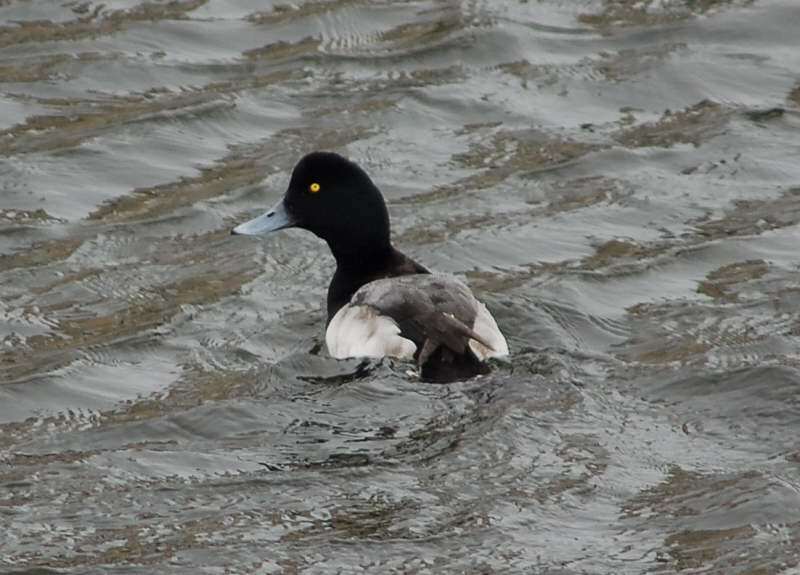 The Greater Scaup (Aythya marila), just Scaup in Europe, or colloquially “Bluebill” in North America for its bright blue bill, is a mid-sized diving duck though it is larger than the closely related Lesser Scaup. It is a circumpolar species, which means that its range circles one of Earth’s poles. 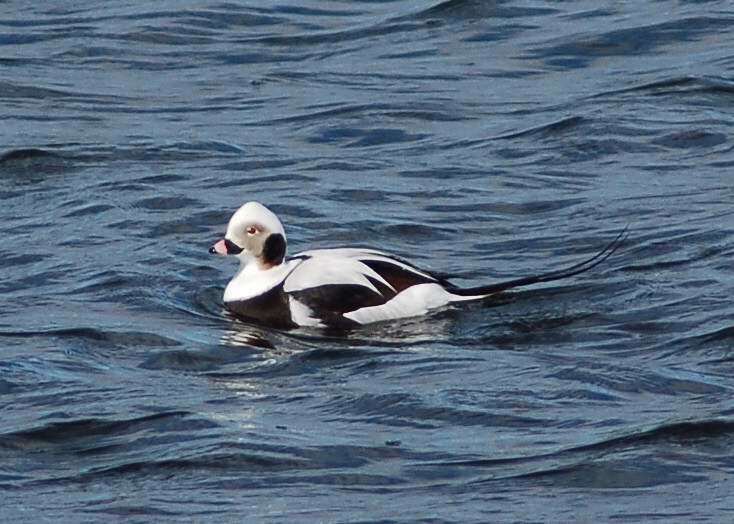 It spends the summer months breeding in Alaska, northern Canada, Siberia, and the northernmost reaches of Europe. 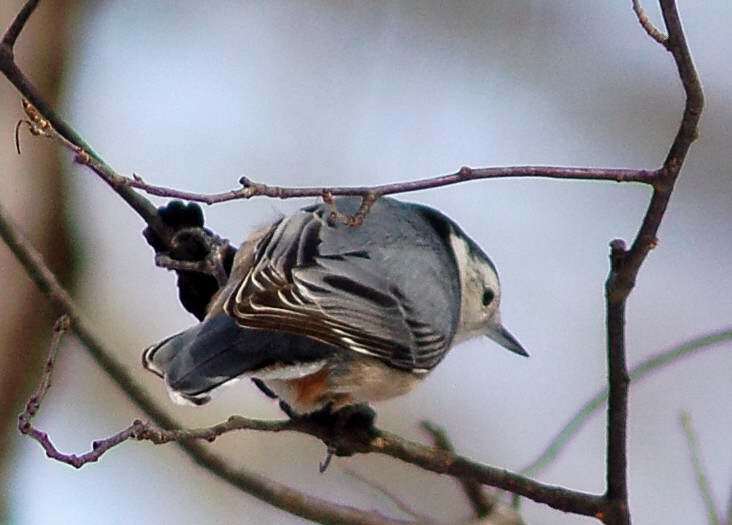 During the winter, it migrates south down the coasts of North America, Europe, and Japan. 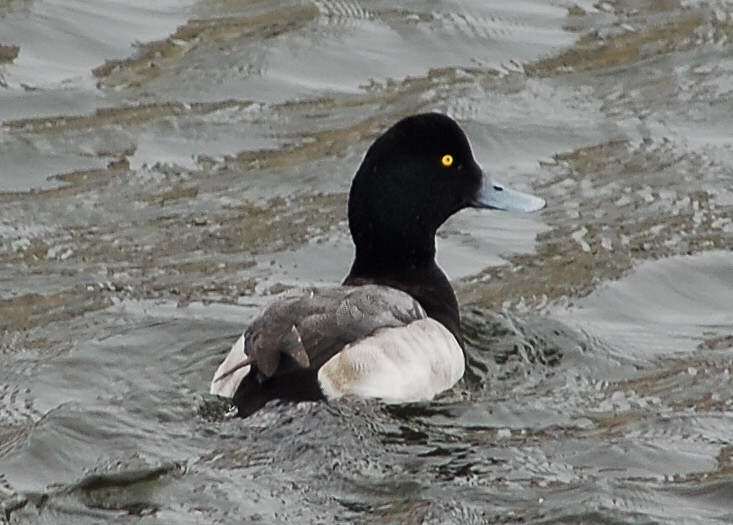 Drake Greater Scaup are larger and have more rounded heads than females; they have a bright blue bill and yellow eyes. 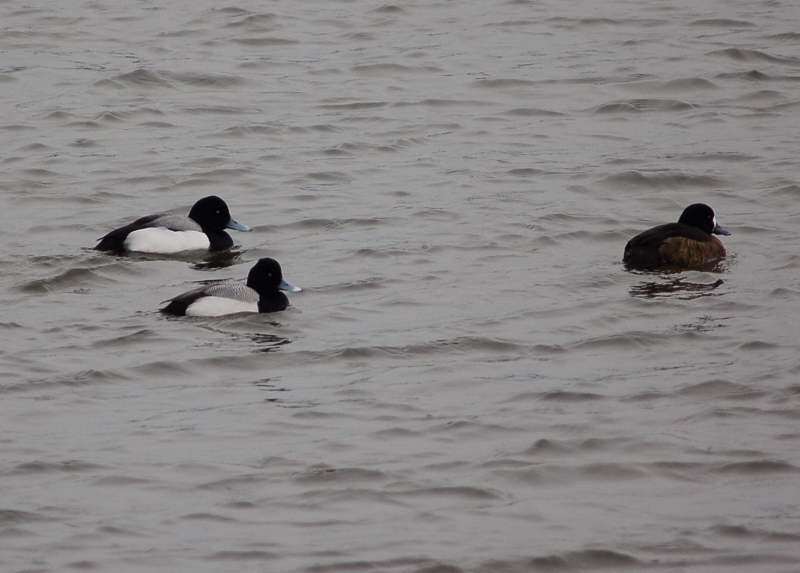 They have dark heads with a glossy green tint, white undersides and wings with white on the tips. 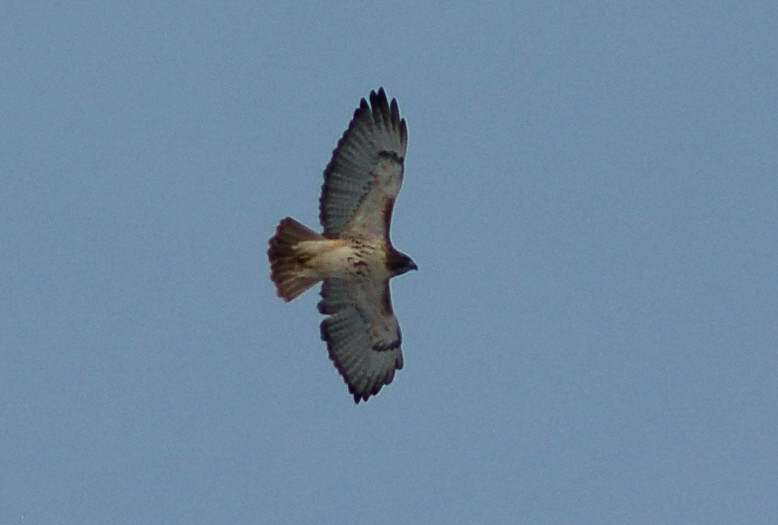 The females are mostly brown, with white bands located on their wingtips. 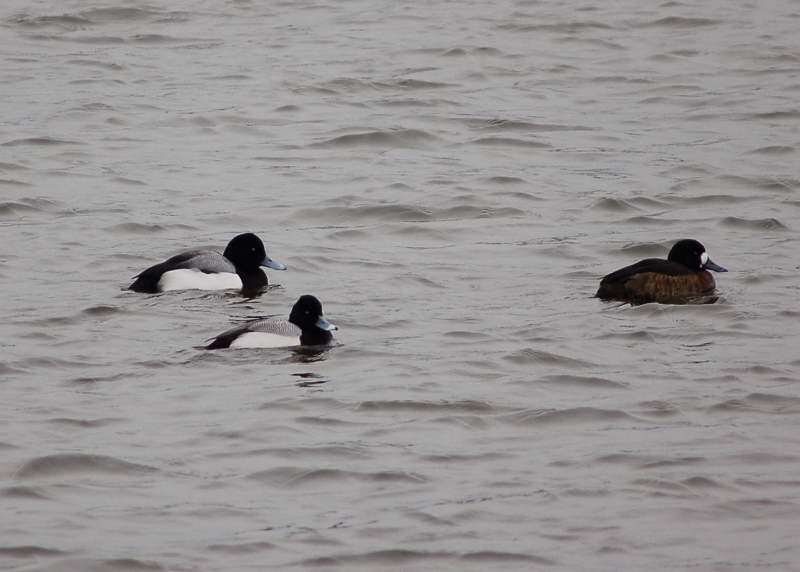 They have a blue bill that is slightly duller then the drake’s. 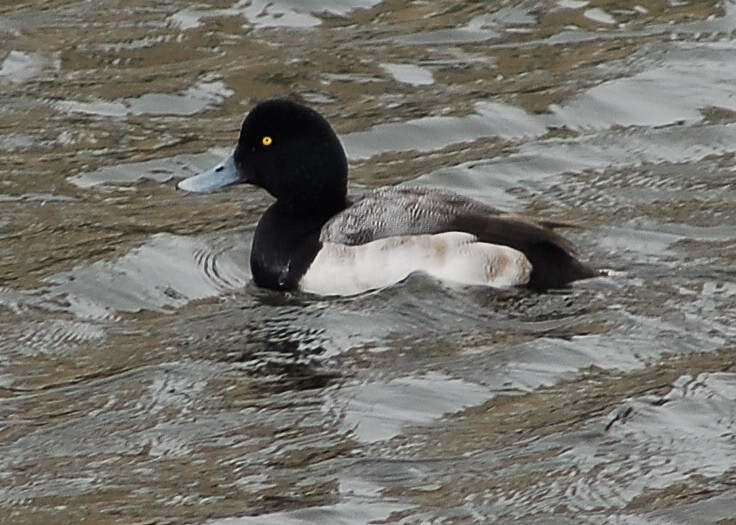 Greater Scaup nest near water, typically on islands in northern lakes or on floating mats of vegetation. 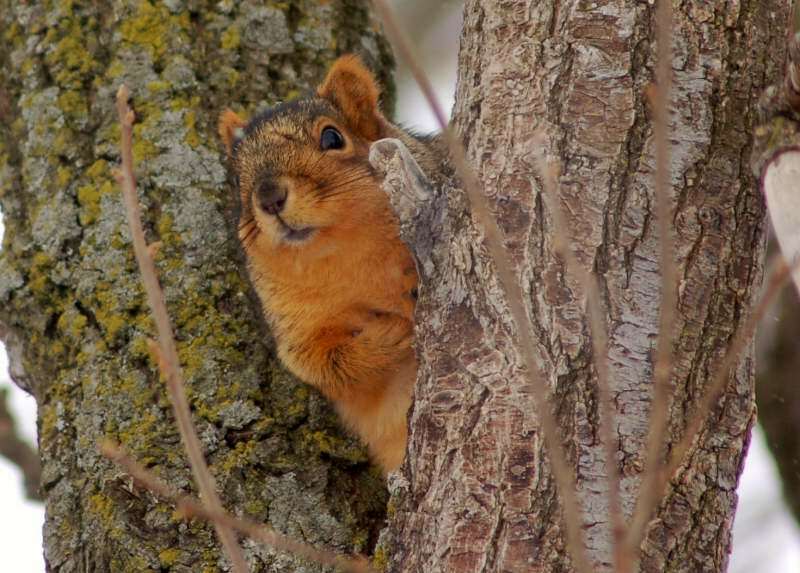 They begin breeding at age two, but start building nests in the first year. 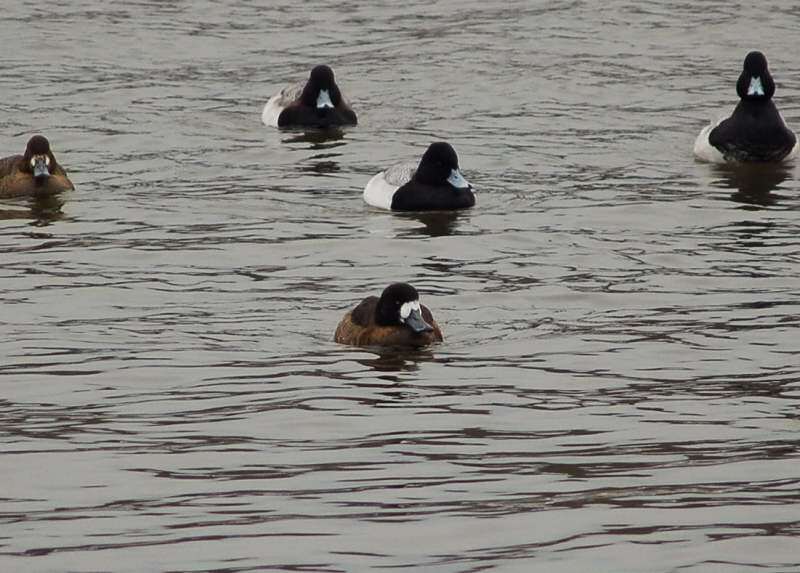 The drakes have a complex courtship procedure, which takes place on the return migration to the summer breeding grounds and concludes with the formation of monogamous pairs. Females lay a clutch of six to nine olive-buff colored eggs. The eggs hatch in 24 to 28 days. 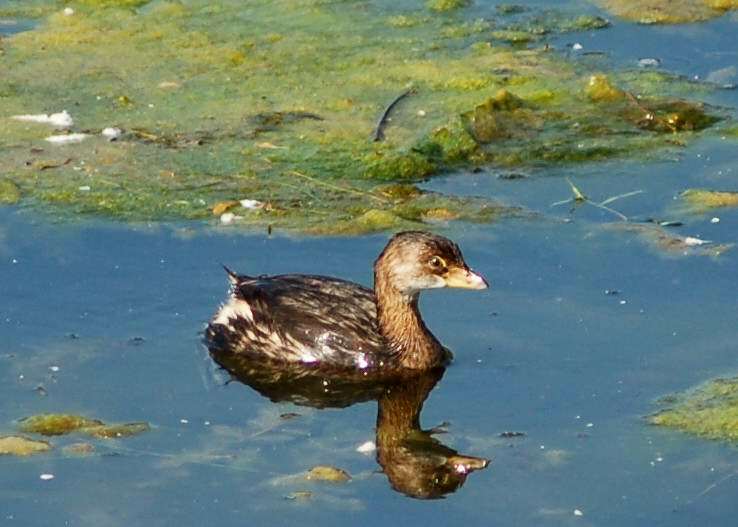 The down-covered ducklings are able to follow their mother in her search for food immediately after hatching. 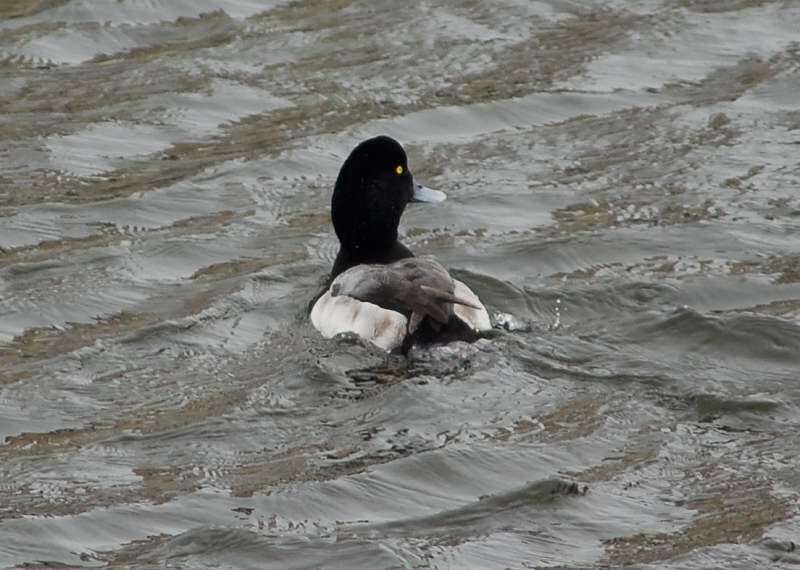 Greater Scaup eat aquatic mollusks, plants, and insects, which they obtain by diving underwater. 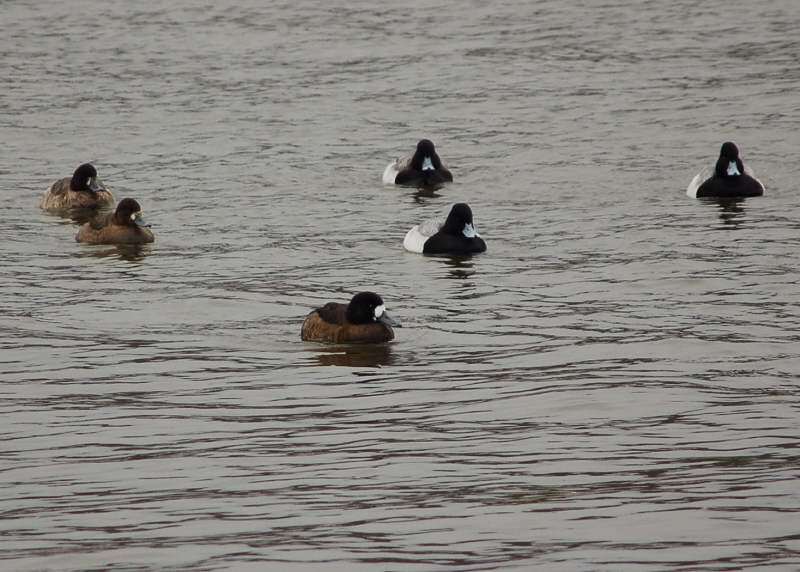 They form large groups, called “rafts”, that can number in the thousands. Their main threat is human development, although they are preyed upon by owls, skunks, raccoons, foxes, coyotes, and humans. This is number 37 in my photo life list, only 313 to go! In North America, it is sometimes called Oldsquaw, though this name has fallen out of favor under influence of negative connotations of the word squaw in English usage. 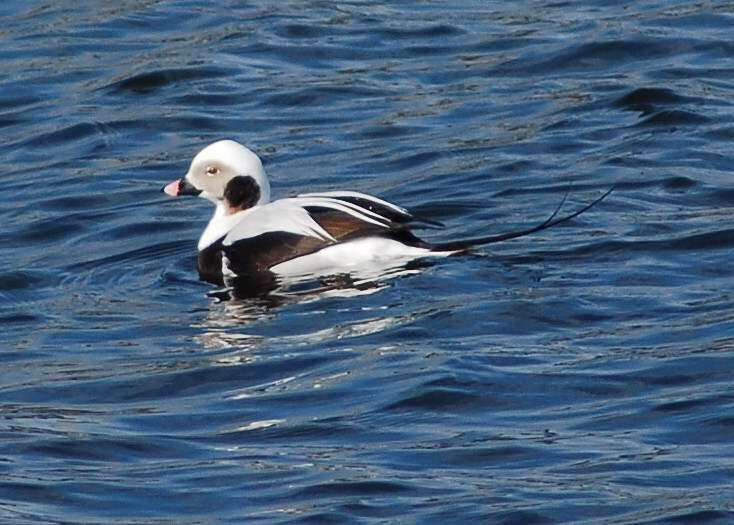 Adults have white underparts, though the rest of the plumage goes through a complex molting process. 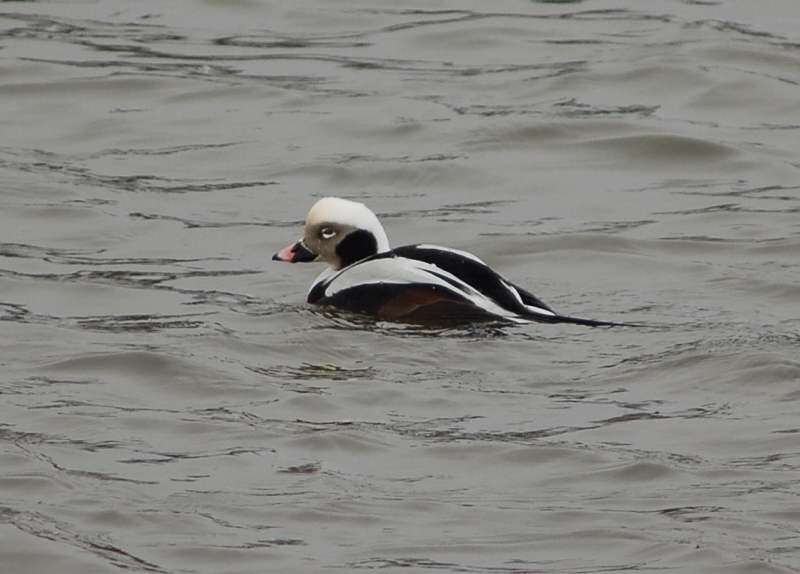 The male has a long pointed tail (10 to 15 cm) and a dark grey bill crossed by a pink band. 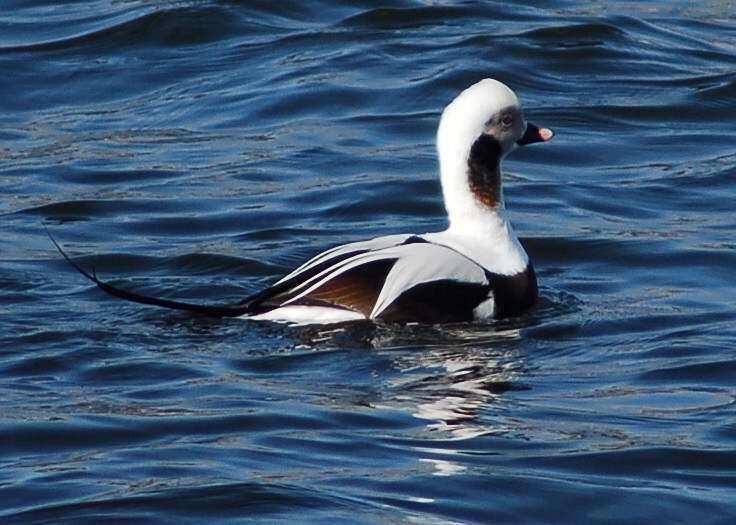 In winter, the male has a dark cheek patch on a mainly white head and neck, a dark breast and mostly white body. 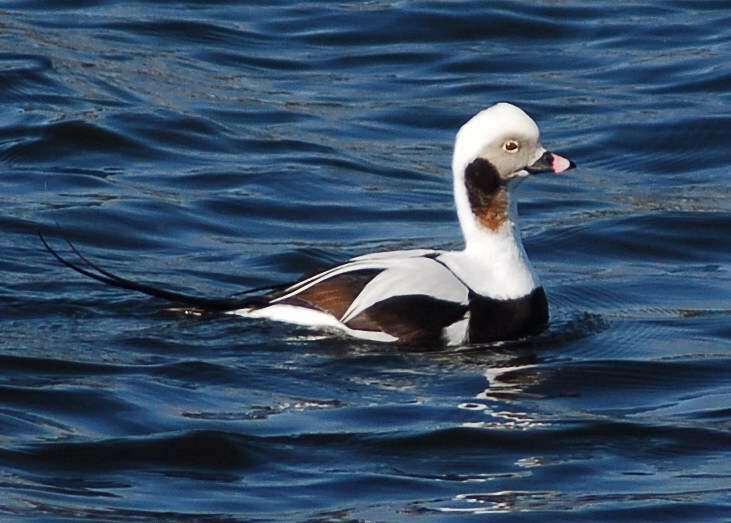 In summer, the male is dark on the head, neck and back with a white cheek patch. 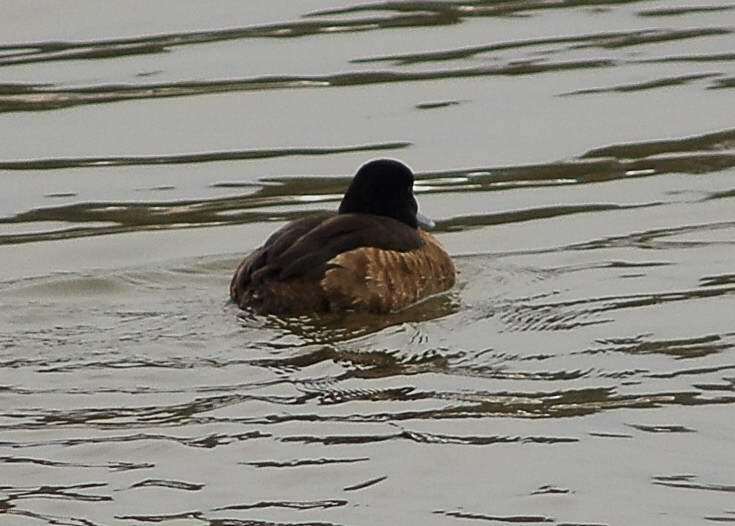 The female has a brown back and a relatively short pointed tail. 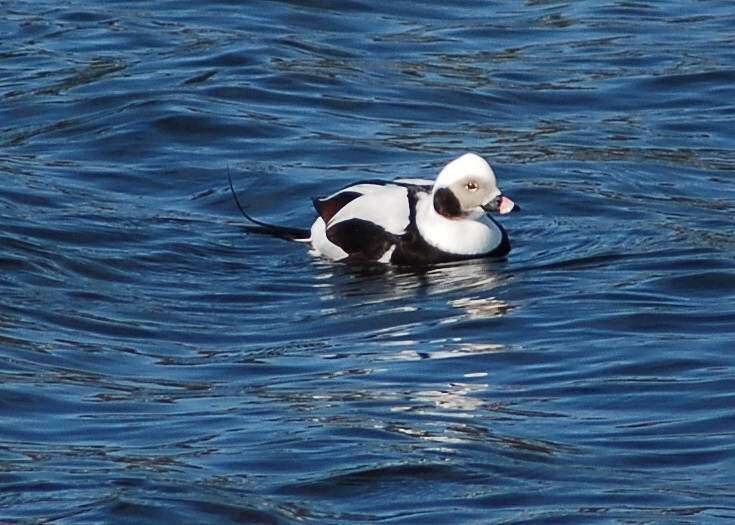 In winter, the female’s head and neck are white with a dark crown. In summer, the head is dark. 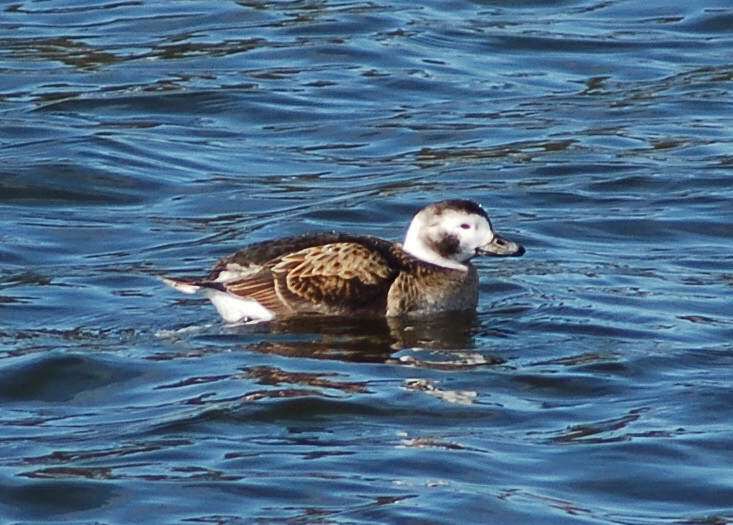 Juveniles resemble adult females in autumn plumage, though with a lighter, less distinct cheek patch. 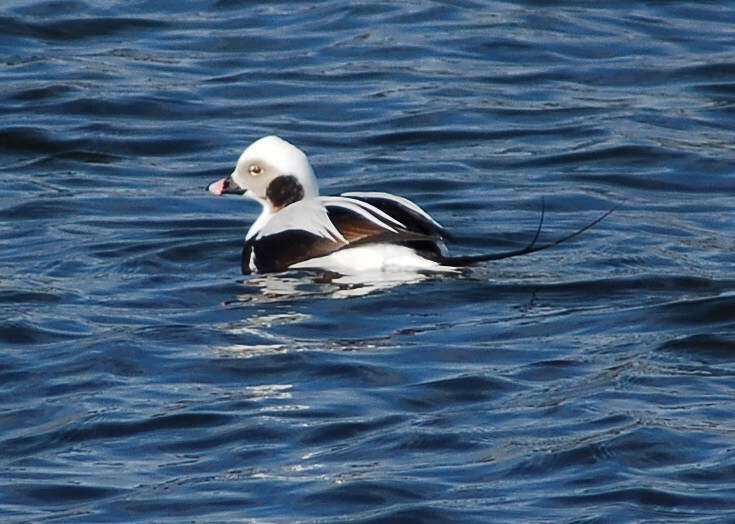 The Long-tailed Duck is gregarious, forming large flocks in winter and during migration. 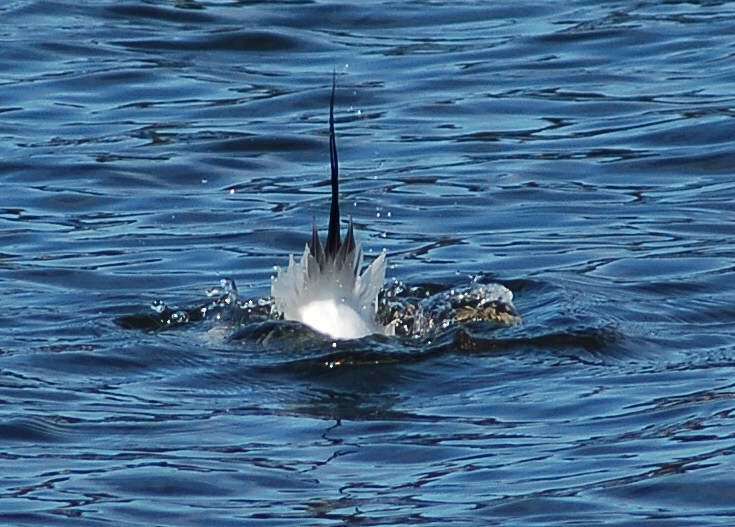 They feed by diving for mollusks, crustaceans and some small fish. Although they usually feed close to the surface, they are capable of diving to depths of 60m (200 feet). This is number 36 in my photo life list, only 314 to go!